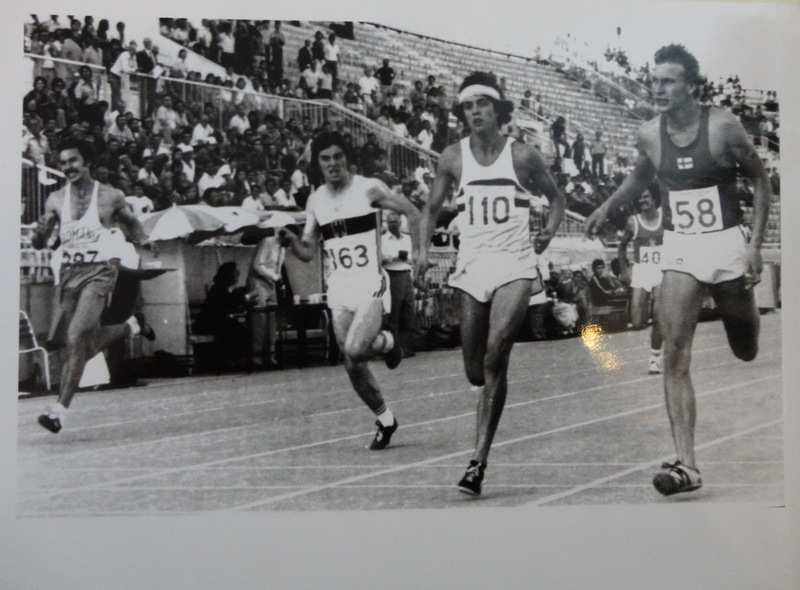 Peter Hoffmann was a very good runner indeed who represented Scotland and Great Britain with distinction. 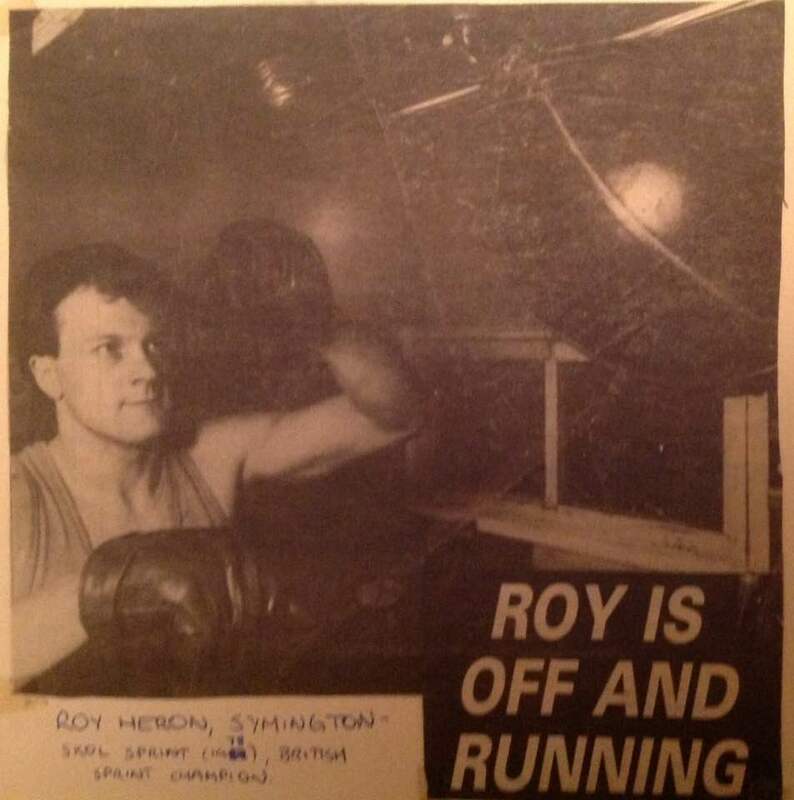 He also knew his way around Scottish athletics and, training as he did at Meadowbank, he met and mixed with the professionals who also trained there. I asked him for his thougts on the professional/amateur interface and his response is printed here in its entirety. Brian, thanks for asking for my thoughts on the connections or links between amateur and professional athletics. First of all I’m out of touch with both codes but from afar in 2019 it would seem we’re in a happier place where athletes can now compete together. In arriving at this new open era and culture of glasnost many of the seeds for change were sown back in the 1970s and nurtured at Edinburgh’s Meadowbank Sports Centre. I suspect too that the harbingers for change occurred at the grassroots level rather than in the more rarefied echelons and boardrooms of athletics officialdom. Back in the 1970s some of the barriers were being broken down and there was a lessening of a silo mentality between the two codes. I sometimes trained with the Pros at Meadowbank. With some exceptions the main difference between the two codes was that in amateur athletics, participants started at the same line or stagger and ran the same distance; whereas a handicapping system was at the core or heart of professional running. And whilst you could make a case for the former being the more pure format there’s actually a very strong case for the latter being superior for both the athletes and as a spectacle for the public. But in reflecting on the two codes I wonder if there was (is?) also a paradox at the heart of professional athletics compared to its sister sport. In principle the sport is based on an approach (which interestingly partly overcomes some of society’s reservations and doubts about competition) on the notion that every competitor should in theory be in with a fair chance of winning or being there or thereabouts on the line – together at the finishing tape. And yet we know that in practice this hasn’t always happened resulting in an interesting corollary to this which made the code generally different to its sister sport. Whilst on the physio’s bench I heard many amusingly nefarious stories from the legendary and inimitable rubber, Denis Davidson, and his tales of athletes not trying throughout the season as a strategy to outfox the handicapper with a view to improving their marks and therefore their race chances with the schools disguising their charges’ true worth in order to make handsome monies from betting coups at the likes of the Powderhall Sprint on New Year’s Day. I’ve enjoyed following the Memoirs of Professional Athletics Facebook page, making one or two occasional contributions. But at the outset I should say that I have no deep knowledge of the code but neither am I ignorant of it, with more than just a passing interface, interest and knowledge of the sport. 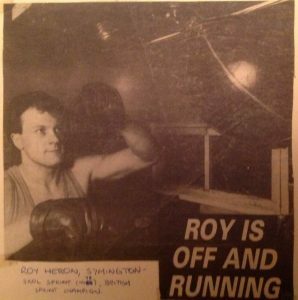 My interface was limited to a relatively small period of time between the years 1971 and 1978 at Meadowbank Sports Centre including not just athletes but also with coaches; rubbers (physios) and one or two bookmakers too. I only ever attended one or two games – a couple down at Peebles but like many amateur friends we always attended the annual ‘Powderhall Meeting’ at Meadowbank over New Year. I’m in the slightly unusual position of being able to not just make observations from the view in winter but can access the view in spring too where back in the day as a teenager and young man I recorded occasional impressions, reflections and thoughts as well as specific training details including sessions with some Pro athletes. 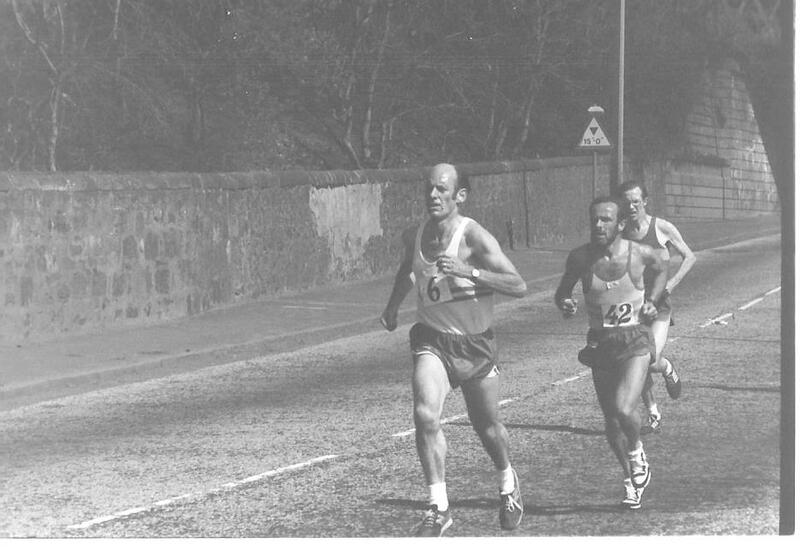 In the early 1970s Jimmy Gray and 3:57 miler Adrian Weatherhead regularly trained together. These were often brutal sessions, usually involving 8 x 400 metres (1 minute recovery) in sub 60 seconds with Adrian and Jimmy knocking spots off each other. Adrian had the utmost regard for Jimmy and is of the view that if Jimmy had similar opportunities then Jimmy would have been a sub 4 minute miler too. And don’t forget Jimmy was training after a full day’s work as a brickie. A young Paul Forbes sometimes joined in these sessions and was left reeling. 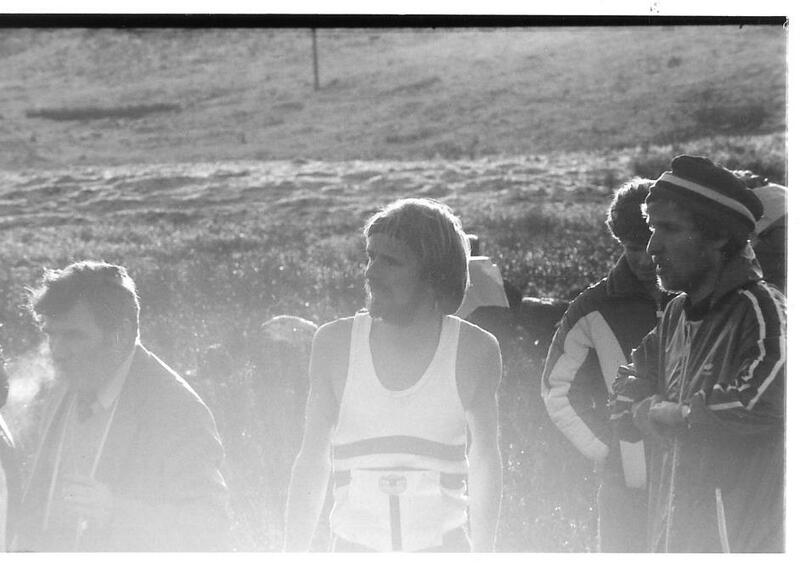 In 1971/1972 two athletes from the great divide who had a mutual respect for each other were George McNeil and David Jenkins. I believe that if the former been able to compete at the 1972 Olympic Games in Munich he would have won at least the silver medal in the 100 metres against the great Valery Borzov: and similarly if Jenkins had focused on training for the 200 metres (I believe he ran the wrong event (400 metres) in Munich) it would have been between him and Borzov too, especially over four rounds of competition. 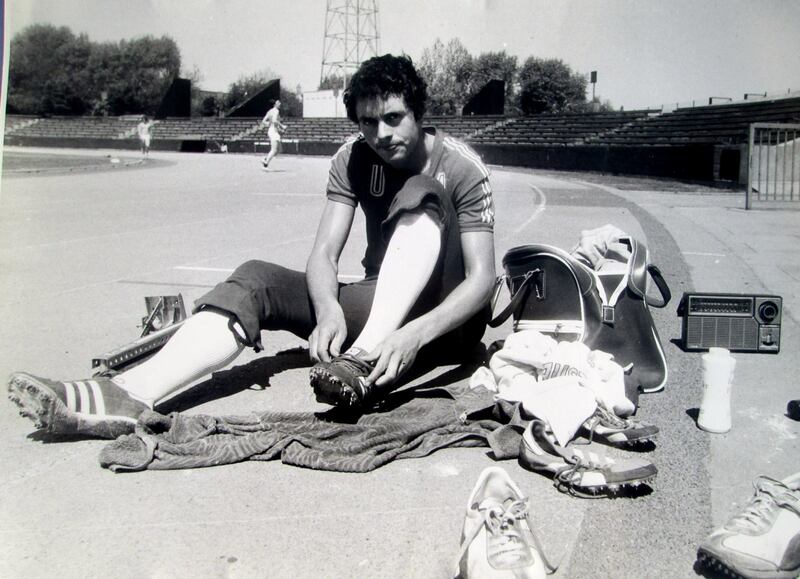 I recall how earlier in the year David turned up at the 1972 American Championships and finished second in the 200 metres event whilst in August at Meadowbank he ran 20.3 seconds a few weeks before travelling out to Germany. David had the highest respect for George and they occasionally did a few sessions together. In 1975 I think McNeil was past his peak but he was still an astonishingly good athlete. I also sometimes trained with Jimmy Smith who was an outstanding sprinter too. 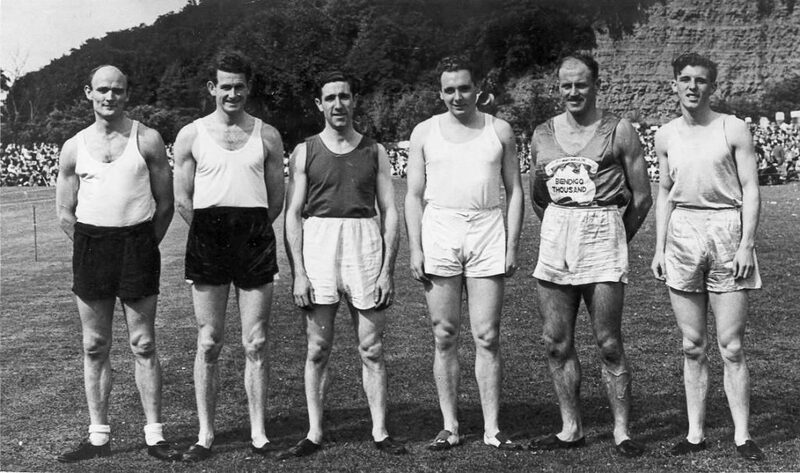 Jimmy was intending to compete in a different event over the longer effort of 400 metres at the 3M Pro Track and Field so asked if he could join in with Bill Walker’s squad. Training with George and Les in quick succession and proximity gave me an insight into both of them and despite my great admiration for Les being a double-Olympian I have no doubt who was the better sprinter and athlete. Reflecting on the concept of an interface here are some quick thoughts: I wonder if ironically there was sometimes a greater preparedness and open culture for the two codes to train together in direct comparison to e.g. 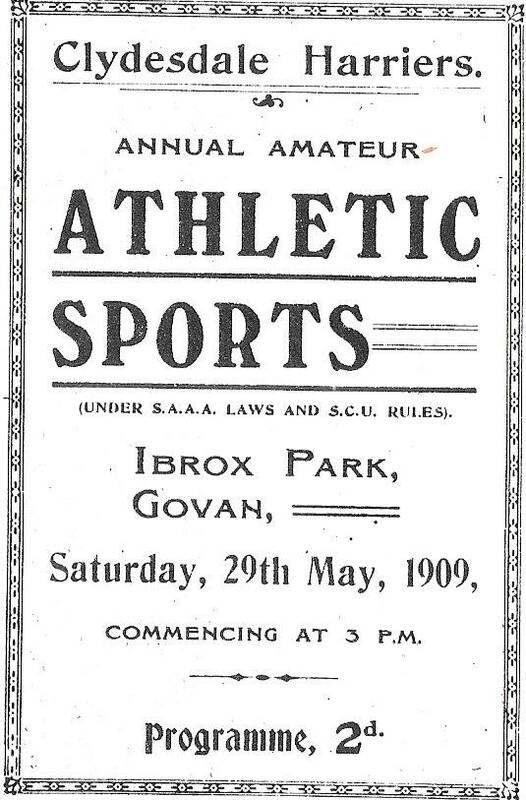 separate schools of professional athletes but this of course is understandable particularly with regard to handicapping and the betting dimension; there are numerous examples of the two codes working alongside each other – just think of John Robson a great international athlete who came out of the professional scene and background coached by John Lauder from Kelso; Dave Campbell who whilst predominantly a coach to professional athletes also helped some amateurs too – one of his innovations was handicapping training repetitions over e.g. 300 metres; then there was Dave Gibson and his right-hand man David Taylor; the former was a measured, shrewd coach and a very pleasant man usually to be found smoking a Dunhill cigarette whilst casting a beady eye on what was going on in the oval – as a youngster it was from him I first came across the intriguing line ‘It’s the exception that proves the rule’; I always enjoyed a quick chat with him but never knew anything about his hinterland until I came across his fascinating obituary decades later regretting not knowing much about his background at the time – unsurprisingly his was a rich hinterland – if David said something complimentary about me I would think about it and live off his words for a good week or so afterwards such was the respect I had for him; and like many of the old schools he had the skill to bring athletes to peak condition, something which many of those from the amateur code would have benefited from – as the old saw goes, money talks; I know David Jenkins had a great respect for David too and of course he went on to mentor many amateur champions, most famously Dougie Walker, the European 200 metres champion; a completely different character, but nevertheless a real one was Alf Nicol and his son Ross who was a solid runner who often joined Adrian Weatherhead and me in the winter of 77/78 at weekends either on the track for 8 x 300 metres or 4 x 600 metres and afterwards on 6 mile recovery runs around Craigintinny Golf Course; the rubber Denis Davidson who although firmly rooted in the professional scene was a great bridge between the two disciplines as he rubbed not only professional athletes but also amateurs too including David and Roger Jenkins – Denis was very friendly with Roger and he also regularly provided treatment to Paul Forbes and me too; for a while Wilson Young brought a cool detachment and class to the sport working effectively with athletes from both codes including the amateurs Drew McMaster and Allan Wells; I liked Wilson’s style – similar to David Gibson he was attired in a smart suit, shirt and tie compared to many of the amateur coaches who often wore tracksuits – as a youngster this cemented their difference and for me added to their gravitas but in Wilson’s case provided a stylish light touch; I also note in my journals how during the winter of 1977/78 I enjoyed a coffee at Meadowbank with both Young and the great amateur throws coach Stewart Togher finding their exchange on training theory quite fascinating; back in the day knowledge came slowly – I recall old Bob Pringle along with others having a chat and a coffee in the Meadowbank cafeteria – I wasn’t discourteous but probably thought Bob a little old fashioned in his ideas; but today because of the Memoirs site I’m much more informed about Bob’s rich history and of course I now realise I should have been more assiduous and gleaned as much as I could from his experience and knowledge…another example of youth being wasted on the young (Proverbs 22:15 ‘Foolishness is bound up in the heart of a child…’); but Bob helped out many amateurs too including Owen Quinn; then there’s the legendary Jimmy Bryce who helped Linsey Macdonald to an Olympic medal; I recall sometimes speaking to the excellent Bert Oliver and his dad on Sundays during their pre-season training; and of course many of David Gibson’s athletes – Freddy Bell who was an extraordinary and extrovert guy and also David Valentine – David was perhaps the nearest Pro at the time to me in his range of distances with his extraordinary success in winning over four classic New Year distances albeit running much slower performances to me particularly over 400-1000 metres; then there was Scott Brodie and Drew Hislop, two young champion sprinters who both gave up promising amateur careers having represented Scotland to transfer to the professional scene which at the time caused a small sensation; and then come New Year large groups of us used to go along to watch and be an integral part of the scene including Paul Forbes; Bill Walker etc. and of being impressed by the likes of Roy Herron or enjoying Pat Mulgrew’s victory and because of the connection with Denis we felt we were able to vicariously enjoy a small part of his success; I recall one or two of the bookmakers including the extraordinary Pilmar Smith who had links with the amateur side too; on one occasion I went round to Pilmar’s home on a Sunday in July 1978 to watch a tape of my abysmal tactics from the day before when finishing a close second to Sebastian Coe at the UK Championships; a last example of an interface was when the legendary Jim Bradley came across to the United Kingdom having travelled from Australia: Bill Walker arranged for Bradley to come along to cast his eye over our squad: when I arrived in the Meadowbank Café in a pair of jeans all of 5 foot 10 inches and 143 lbs I don’t think I cut a particularly impressive figure, however I’ll never forget Jim’s comment to me after I’d warmed up and taken my tracksuit off to start the training session – he said – ‘Well, you strip BIG!’; when I reflect on his contribution to the amateur code I think one of the things he brought to the world of sprinting was going back to first principles and the key importance of having a strong core (stomach); legs and arms and a philosophy grounded in biomechanics with an important focus on an efficient running style; in bearing legacy to this philosophy are the many relatively ordinary athletes who after a year or two training with schools often found up to ten yards in their running over 110 metres – really great stuff, which some of the shrewder amateur coaches and athletes tapped in to; and of how the new Meadowbank Sports Centre helped to facilitate and foster that interface too because the new centre was much more than just a sports facility but also a social hub and clubhouse bringing many people – athletes and coaches together forming good relationships and an exchange of ideas bringing out the best from both codes. After half a lifetime isn’t it wonderful to see the great strides that have been made to bring the two sports much closer with athletes now training and being able to compete together. Thanks, Peter: excellent content, beautifully expressed. There were two different athletics codes but were there two different sorts of athletes? It doesn’t seem so – all the basic personality and environmental qualities are required for them both. The pleasure in taking part in sport in the open air, the preference for individual events where the athlete responsibility for his own performance against team sports where the credit/blame is shared and there whether you are a pro or an amateur. The athlete needs to be the sort of person who trains hard almost every day of the week, for at least 50 weeks of the year for his event regardless of the code. These of course are best developed if the young athlete is brought up in a home where sport is seen as important, where an active lifestyle is practiced and the example is added to by a genuine desire to help any children take part in their sport. These are all true whether those running are doing it for a casserole dish or for pennies. However the two codes are not totally separate. In a country as small as Scotland with thriving professional and amateur circuits in the Borders, in Fife, in the West Highlands, etc, that would be impossible. In fact athletes often take part in both codes at one time or another in their career. Second, there are runners who seem to have a foot in both camps: I saw a post on Facebook about a borders runner, pictured running at Meadowbank, which read “Another pro pretending to be an amateur!” There is a very successful professional athletics scene in the Borders with meetings held in Kelso, Hawick, Innerleithen, Jedburgh and all have noble traditions going centuries back in time. All know about them – at least they know about their local games and training groups. They also know about a different type of Games – the Commonwealth Games as well as the Olympic Games, and European Games; they know that access to these is limited to amateurs and given that there are very good athletic clubs such as Teviotdale Harriers and Gala Harriers in the area as well as bigger clubs in nearby Edinburgh, the athletes have the choice of codes. And it is an informed choice. So – ideas flow back and forth. The British National Coach once said in a ‘Glasgow Herald’ interview that “if black English sprinters trained like white professional Scottish sprinters, then they would be unbeatable.” Nowadays that would never be said in those terms but it was a clear indication that this respected coach believed the peds had something to offer. Of course the outstanding example of this was the introduction of the speedball into the training of amateur sprinters. It had been used by professional coaches for many years but it was only when Wilson Young used it with Allan Wells that people looked, discussed it, liked what they saw and heard and started using it themselves. Sledges had been towed by sprinters as a form of resistance training for decades but when the Scottish national coach found out that a former ex-ped had his athletes towing tyres, he had to investigate and soon had his own athletes doing it. However he had to go back to the pro and ask him how he stopped the tyres bouncing around all over the place: he was told to put “a wee dab of cement” inside the tyre. Further evidence that the two codes were not as separate as they might seem. More on these topics to come. Stephen Wylie has been one of the best and most consistent runners in Scotland over a career that so far has covered more than 30 years. He’s still picking up more than his share of medals and first places so it seemed only right that we should look at his career in some depth. He agreed to fill in the questionnaire and his replies are below. How did you get into the sport initially: I started running with my dad Frank back in the early 80’s during the marathon boom; trained with him. Joined him in a few half marathons and even a 15 miles race at the age of 11. I ran over 25 half marathons by the age of 14, running without being officially entered as was too young to compete. 10 Miles: 47:29’ Half marathon: 64:50; Marathon: 2 hours 30 min. Has any individual or group had a marked effect on your attitude to the sport, or to your performances? Some of the guys I trained with, like Charlie Thomson, Allan Adams, Jamie Reid, Alex Robertson were all great training partners. 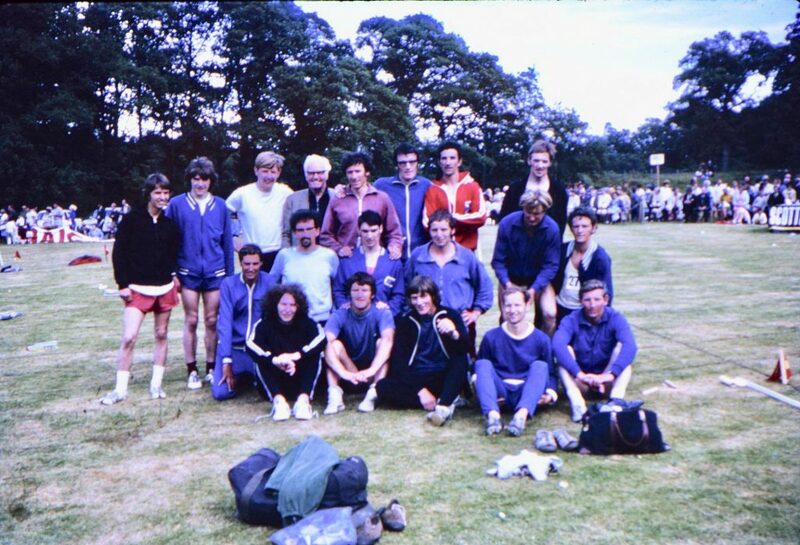 Alastair Macfarlane was my first coach and he had a really good group of runners at the time and was great to have standing at the side of the track and selecting the sessions. I always looked up to, and took a lot from, Tommy Murray who came froma similar background to me, and was always a good guy to talk to. I learned a lot from Tommy and we became rivals and good friends. What exactly did you get out of the sport? I had always been competitive and hate losing, so I knew it was the kind of sport where if you are not naturally talented you can work hard and get results. Also made friends for life through running. Can you describe your attitude to the sport? Don’t like getting beaten but I respect everyone’s efforts as I know how much work they put in. I just like to end a session knowing I have given it everything on that day no matter my fitness. What do you consider your best ever performance? The Dunky Wright Road Race, 1990’s sticks out as it was stacked with all the top runners of the day: Adrian Callan, Allister Hutton, Alan Puckrin, Eddie Stewart and many more. I felt really easy that day and felt as if I could run away from them at any point in the race. After a mile Hutton and I broke away and I had so much respect for him that I almost felt that I could not run away from him but I felt good that day. In the end we came into the last 200m together and I went away to win by, I think, 4 seconds. A couple of weeks later I watched in awe as Hutton won the London Marathon. Another one that gave me satisfaction was winning the reserve race at the first European Cross-Country Championships as I should have been in the team as I finished fourth in the trial and first four were meant to be selected. Anyway, back then each team had two reserves and 48 of us lines up immediately after the main race to run the same course. I won the race by over a minute and my time was quicker than two of the counting GB team in the main race. They actually gave me a European team gold medal as GB were the first team, but it means nothing to me and I don’t even think I brought it home. And your worst? 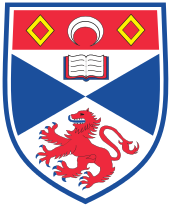 Edinburgh Marathon. It was a scorching day and I was injured, hadn’t been able to train but I thought I would run. Walked and jogged in agony to the finish. I think I ended up in 2:48 but I was in agony. I have never stopped out of a race, no matter how bad I felt. What goals do you have that have not been achieved yet? I still want to compete well for my club and carry on winning medals on the scene. Andy McLindon is from my town and I have known Andy for 30 odd years Great inspiration, running great times for his age He’s a great guy and I admire him a lot. What has running brought you that you would not have wanted to miss? With a club like Cambuslang, there is great team spirit and competition for places on teams whether it’s Senior Men or Masters. I like the fact that you can’t just walk into the Cambuslang first team, you have to fight for your place. 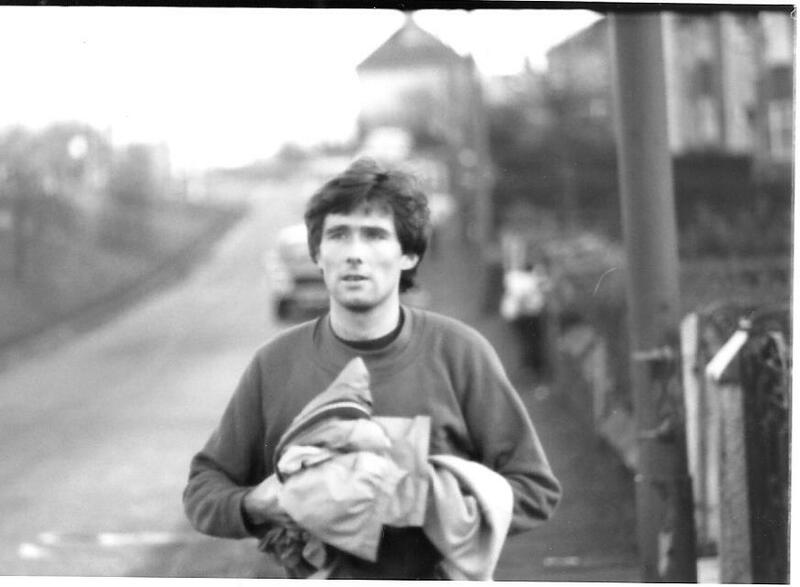 When I moved to Girvan, I met Kerry Liam Wilson who I know won’t mind my saying he was a jogger at the time. Training with him and seeing how he progressed has been great to watch. He is a guy who puts the work in and I like to think I helped instil that in him. Wednesday: Tempo run or long reps.
Stephen (left) receives his first prize. Given his level of performance, Stephen naturally appeared in the national ranking lists for a range of distances and over a number of years. The following list has come from the www.scotstats.net website. 1994 -10 mile national road race 1st; 1994-Half marathon national road race 1st; 2003 -5k national track 1st; 2003-10k National track 1st; 2003-Half marathon champs 1st; 2004-Half marathon champs Gold 3rd overall; (“two non Scots beat me but I got awarded Scottish title”). We’ll come to the cross-country individual and team races as we look through his career in chronological order. We can start in 1992 when he was ranked at 32:37.7 when he finished fourth at Crown Point in June. The first championship of winter 1992/93 was the District Relay Championships at Rouken Glen in Glasgow where Cambuslang finished second with a team of Gormley, Wylie, Runcieman and Murray. 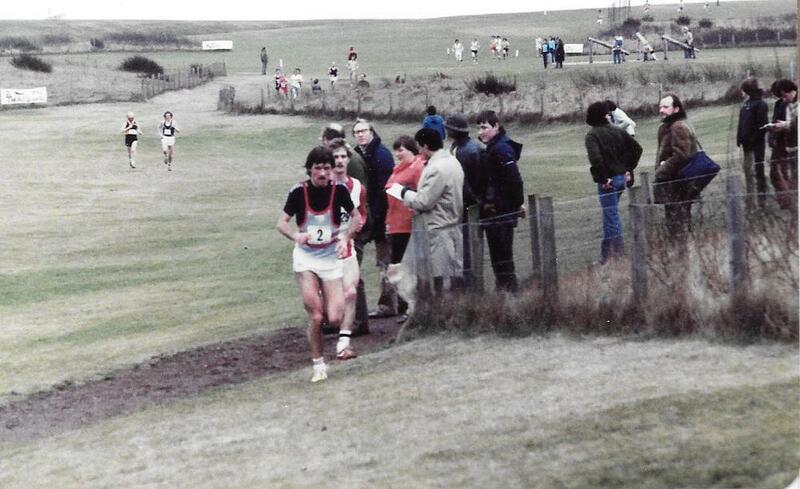 This was followed later in the month by the national cross-country relay championships at Cumnock. This time Cambuslang, with Stephen running first for the team of himself, Croll, Runcieman and Murray. The climax of the relay season was the Edinburgh-Glasgow eight man relay with Stephen running on the third stage. He not only picked up from third to second, he also had the third fastest time of the day for his stage. Not bad for his first E-G race with the team finishing fourth. 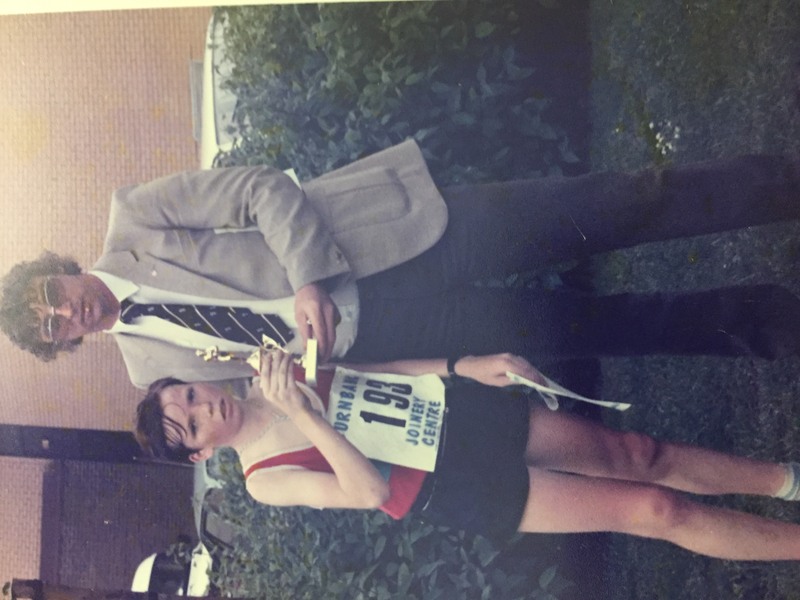 The District Championships were held at Kirkintilloch in January 1993 and Stephen was fourth and second finisher for the winning Cambuslang team (Tommy Murray was first). In the National Championships at Callander Park in Falkirk, Stephen ran an excellent race to finish sixth and be second counter for the winning Cambuslang team. 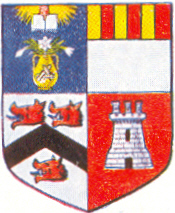 They had beaten Racing Club from Edinburgh by 48 points to 74. Racing Club had their revenge however in the six stage road relays in March when they won by three minutes from Cambuslang for whom Stephen ran second, pulling the team from 18th to sixth with the sixth fastest time of the afternoon. It was then into the track season of 1993. 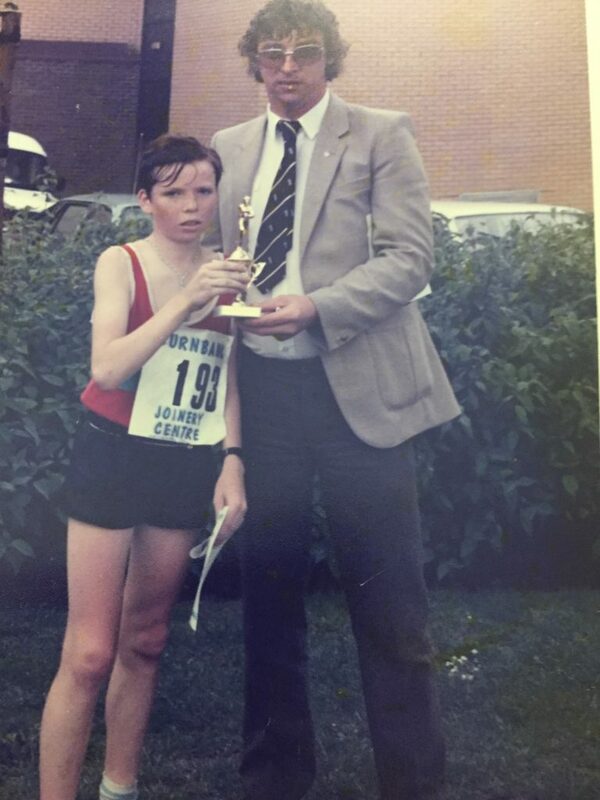 Tommy Murray had defeated Stephen every time that they had met over the country, but at the end of the summer, the positions were reversed with Stephen seventh with a time of 8:15.3 for 3000m while Tommy was eighth with 8:17.3. Tommy’s was run indoors at the Kelvin Hall track and he won many track titles over that distance indoors over the years. Stephen’s 3K time ranked him 72nd in Britain. At 5000m Stephen was ranked 21st with his time of 14:43.5 when he won at Crown Point on 15th August, but Tommy was one of the 20 ahead of him with a time of 14: 08.83 to be third ranked. In the 10000m he was seventh with his time of 30:42.51 run at Linwood on 24th July. 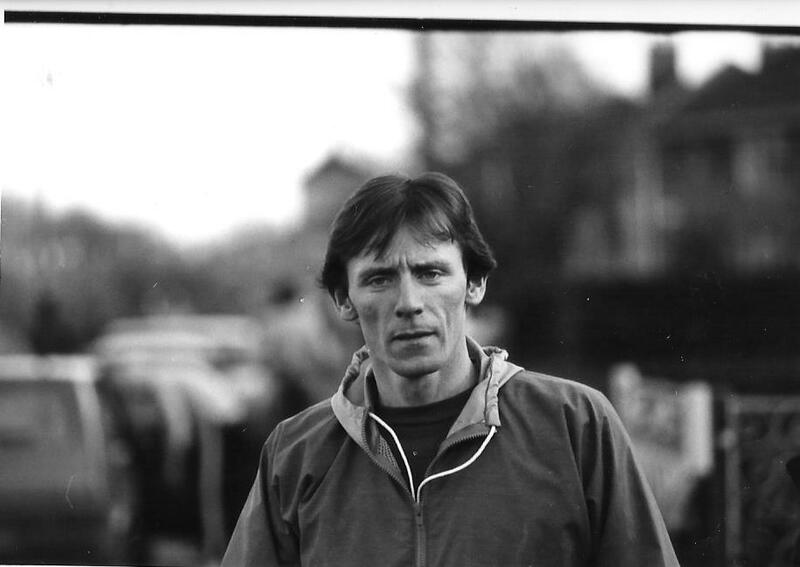 This was the first year that the Athletics Yearbook had road rankings and Stephen was ranked in the 10,000m at seventh, 52nd in Britain, with a time of 29:49, and at 10 miles he topped the rankings with 47:29, This 10 miles time was the one he recorded at Inverness on 19th September when he won his first Scottish title from Charlie Thomson and John Mackay. All three were covered by 4 seconds. 1993 was also the year when he won the Tom Scott 10 miles road race for the first time – he was to win it again 10 years later. Time difference? 47:29 in 93 and 48:20 in 2003. He had a notion to win it ten years later to make it three wins in three separate decades but the Eritrean asylum seekers were running for Shettleston by that time so the dream never materialised. 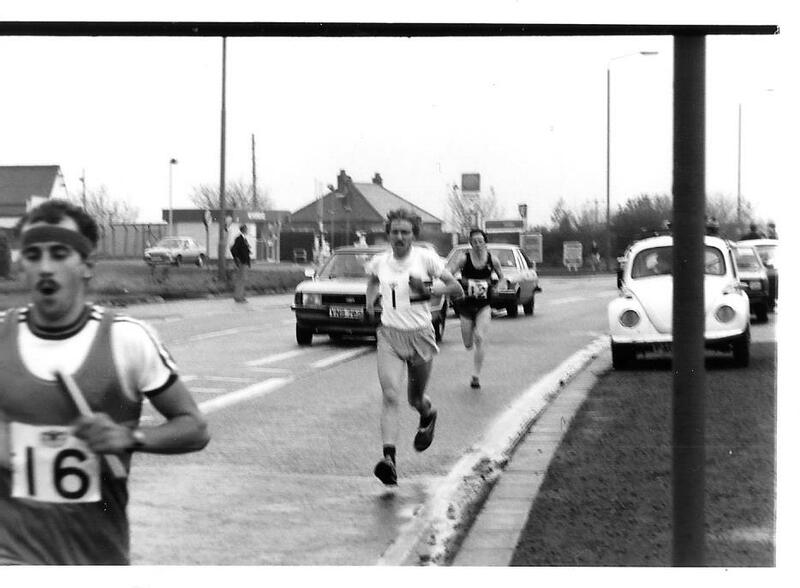 It was now into the winter of 1993/94 and the first championship as usual was the West District Cross Country Relays. It was a poor start for Cambuslang who finished in sixth, well out of the medals but they were back in form by the time of the national relays. Stephen had a superb run this time turning in the fastest lap ahead of Quinn, Robison, Murray, Croll, Cavers, Callan and all the rest as his team finished second, eleven seconds behind Leslie Deans RC, formerly Racing Club. The big one was next: the E-G. This year Cambuslang was third – and largely due to Stephen Wylie’s excellent run on the last leg. 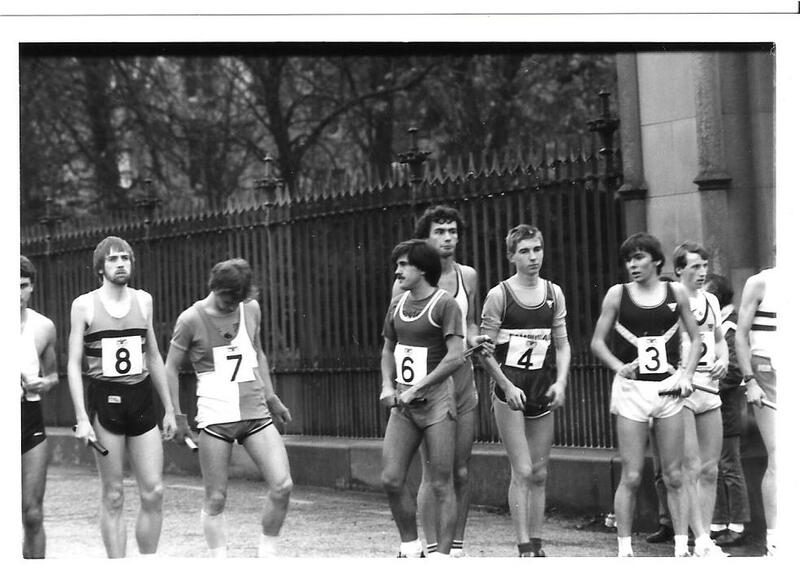 He pulled the team from sixth to third in the fastest time of the day, 47 seconds faster than Peter Fleming who had left Bellahouston to run for Leslie Deans. 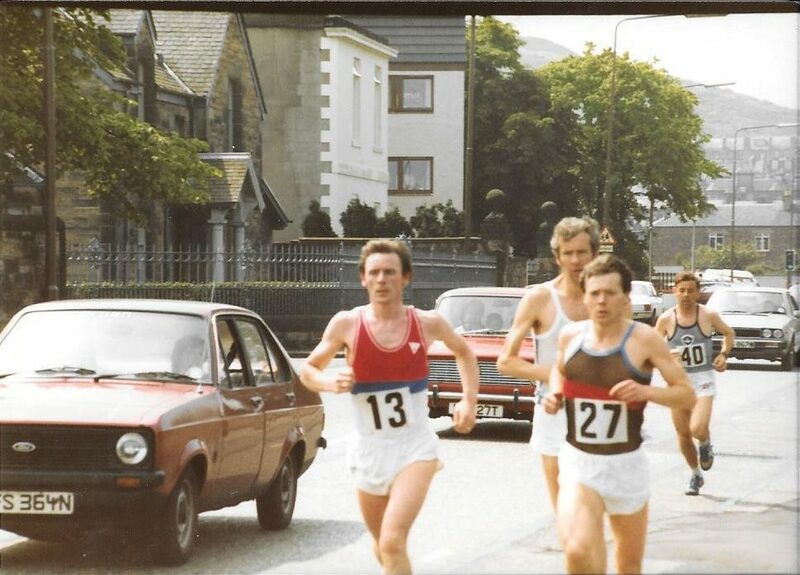 By the time of the West Districts, Tommy Murray was running for IBM Spango Valley and Stephen in fifh place for the winning Cambuslang team with Shettleston second and Clydesdale third. In the National, Stephen was down in 15th place, fourth Cambuslang Harrier to cross the line, and the team was first with 92 points to Leslie Deans 122 points. 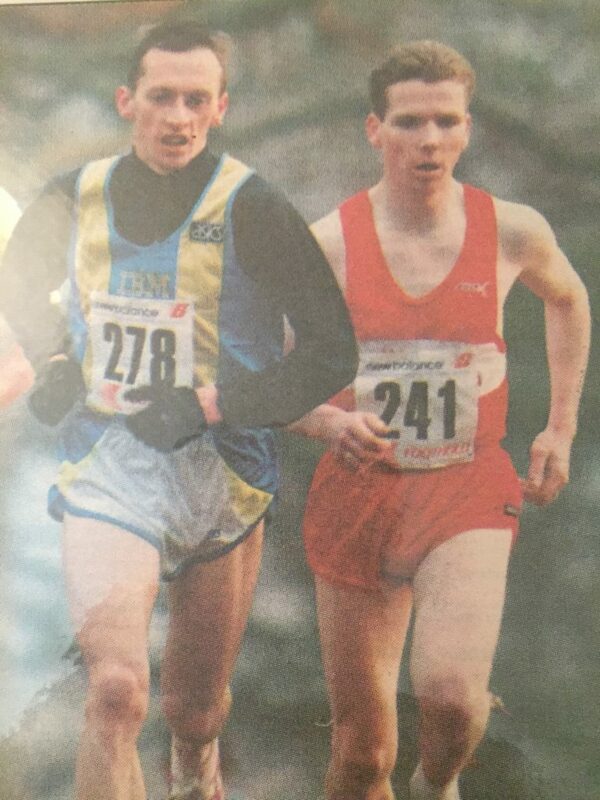 At Irvine on 27th March, 1994, in the Celtic/Five Nations International Stephen won the Under 23 race in 40:06 from Mark Steinle of England on 40:14. He was the only Scottish winner that day. Into summer 1994 and Stephen was ranked again in several events. 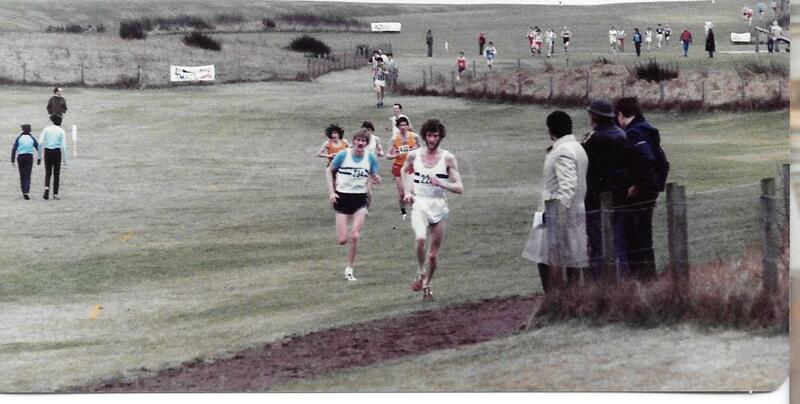 On the track, in the 5000m he was eighth (81st in Britain) after winning at Linwood in 14:25.7, and on the road, he was sixth in the 10K with 29:49 after beating Peter Wilkinson of Leslie Deans by three seconds at Cumbernauld with Brian Kirkwood and Charlie Thomson third and fourth, and in the half marathon a time of 67:19 when he was fourth at Dunfermline in June. The summer season had started well for him with a victory in the Scottish 10K Road Championship at Aberdeen on 22nd May when he won in 30:17 from Charlie Reid of Peterhead who was timed at 31:14, His half marathon time was run in the national championship. 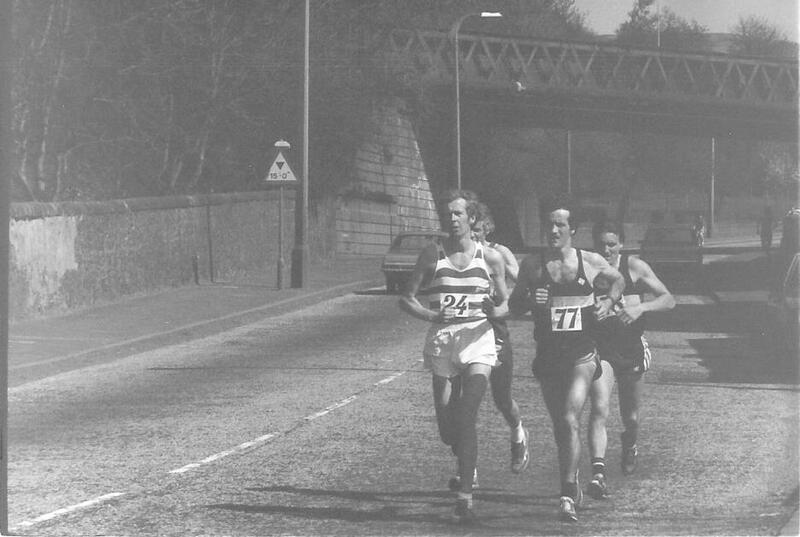 Winter championships in 1994/95 started with the District Relays held at Lenzie and the Cambuslang squad of Fleming, Wylie, Coyle and Runcieman was fourth with Stephen running the third fastest time of the day. Second team in the four man national relays, Cambuslang went into battle on the 13th November in the eight man E-G relay. Stephen was on the fifth stage this time and ran the fastest time of the day (16 seconds faster than Olympian Tom Hanlon and pulled his team from fourth to third, which is where they finished. Stephen was eleventh in the National cross-country championship in 1995, just in front of Alaister Russell, David Ross, Terry Mitchell and Eddie Stewart – not a bad group in its own right. Cambuslang won the title with 55 points, Leslie Deans was on 100 points for second place. The winter season ended as always with the six stage road relays which were held at Kirkintilloch on 19th March. This time the gold medals went to Les;ie Deans with Cambuslang second. Stephen was on the last stage and pulled the team from third into second, just in front of Shettleston. His team on that occasion was Fleming, Croll, Robertson, Runcieman, McTaggart and Stephen himself. 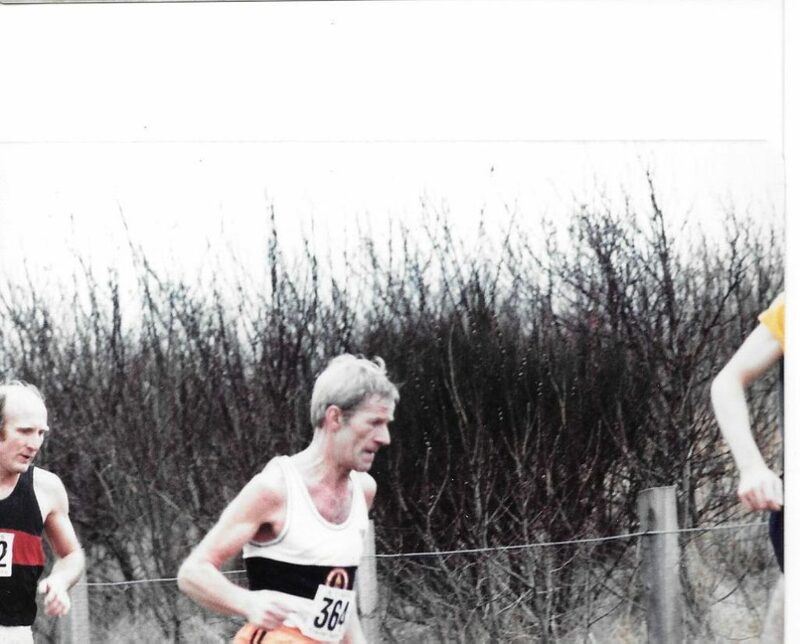 That summer (1995) he was ranked 29:47 for 10K on the road at Cumbernauld in May when he finished third between Bobby Quinn and Alaister Russell; seventh in the 10 miles with 49:12 which he ran at Carlisle in mid-November and fifth in the half marathon after running 66:27 at Alloa on 26th May. On the track, he was 13th ranked in the 3000m with his best time of 8:28.2 at Wishaw on 18th June, and 15th with 14:38.7 for 5000m when he won at Crown Point on 11th June. 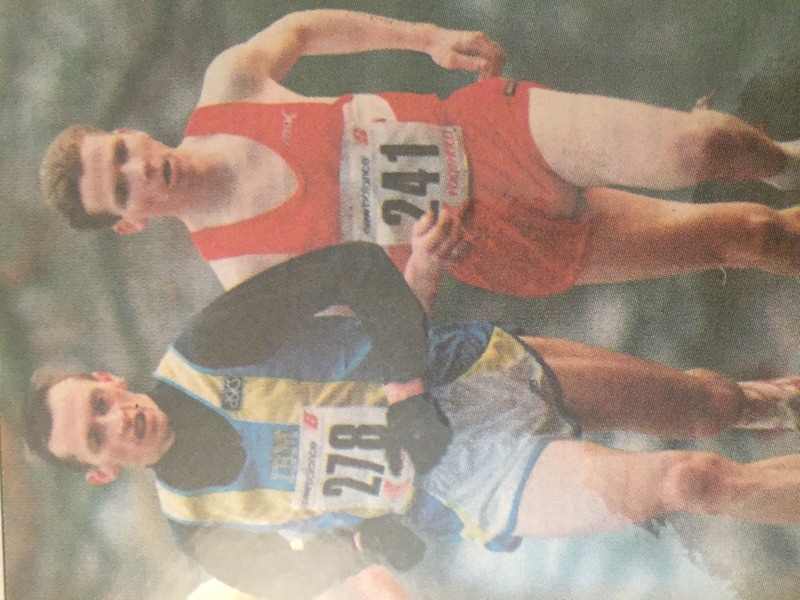 The winter of 1995/96 started with the District Relay Championships where Cambuslang were out of the medals but in the National relay at Prestonpans at the end of October, they were third with Stephen running the last stage after Robertson, Thomson and Croll . 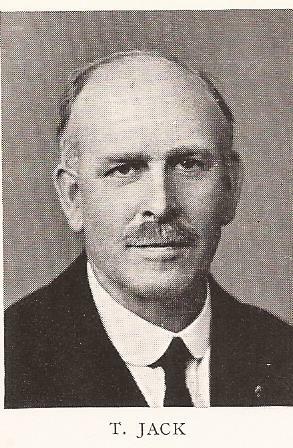 In the Edinburgh to Glasgow at the end of November Cambuslang was second behind Leslie Deans. Stephen did his usual sterling job and towed the team from seventh to third when running on the third stage: he again had fastest time of the day. At the end of the year, in the International and Inter District cross-country match run at Cumbernauld, Stephen was third behind Mowbrey and Robison. Unfortunately, there was no Stephen Wylie in action at the West District championship, the National Championship or the Six Stage Road Relays. Reason? He had moved to live on the Isle of Man. 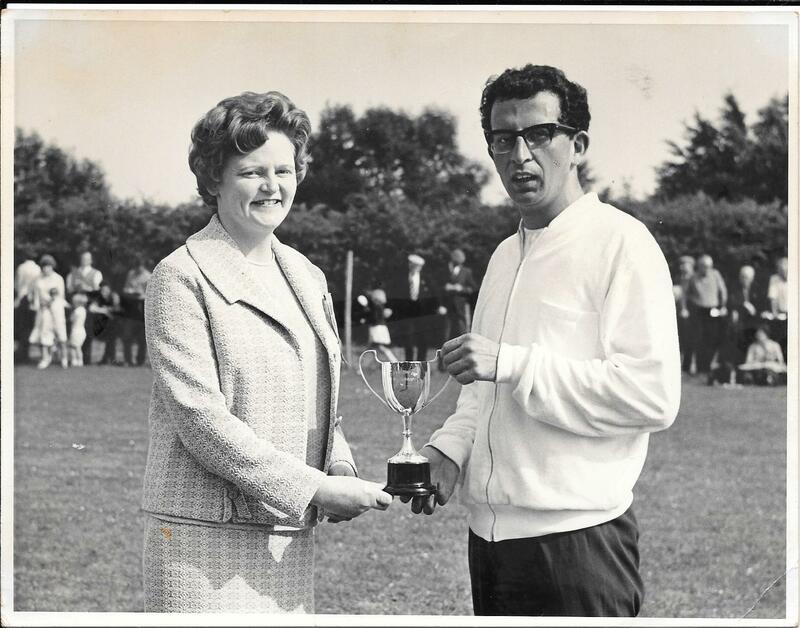 On his first day there, he noticed a 10 mile road race from Douglas to Castletown for the Manx Championship. He entered and won in 48:30. He lived there for seven years during which he continued to train but he didn’t race again until he returned to Scotland in 2003. Stephen was back in summer 2002 and winning races too. 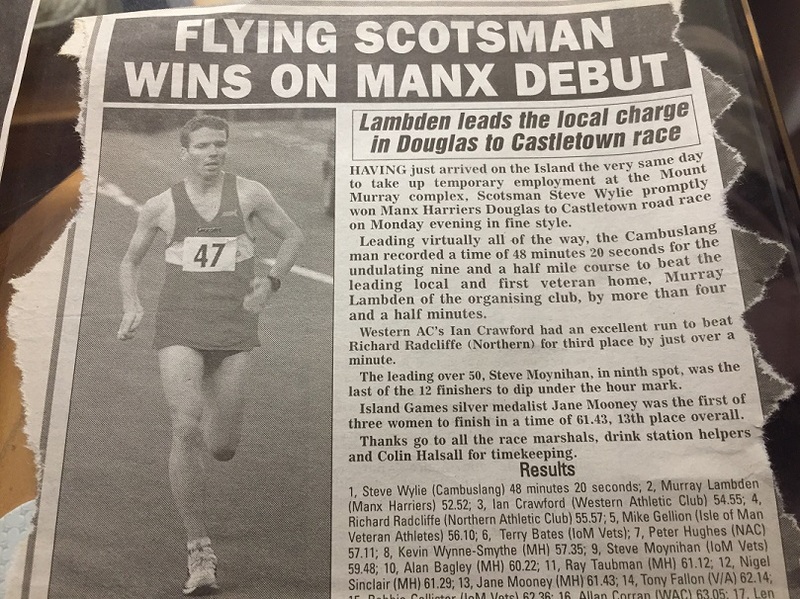 He won at Blackburn on 8th June over 10K in 31:12, then at Beith on 16th June over 4 miles in 20:47; at Perth, also over 10K on 25th August in 32:21. The next win was well into the cross-country season when he won at East Kilbride on 7th December over 10K in 31:12. He had had some good races and he was ranked on the road at 5K with his time of 15:03 at Glasgow on 21st December, at 10K with 30:48 at Edinburgh on 22nd September, and in the half-marathon with 67:28 in Glasgow on 8th September. There were no track times ranked at all that summer. Winter 2002/03 and Stephen Wylie was back in action. In the West Relays he was in the first team that finished second – slowest of the four he was still among the quickest on the day. Came the national relays and he was second fastest Cambuslang man round the course for the team that finished second. On 24th November he ran on the third stage of the Edinburgh to Glasgow and brought the team, which finished fourth, up from sixth to third. He didn’t seem to be firing on all cylinders yet but came the 11th January, 2003, and he won the West District Championships by 50 seconds from his old rival Tommy Murray. 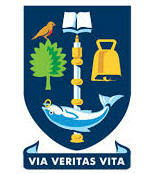 The team won with 79 points from Shettleston Harriers (136 points). The national short course cross-country championship was held on 26th January at Bellahouston Park and Stephen was just out of the medals in fourth place but he was only 10 seconds behind the winner, Steve Cairns of Hunters Bog Trotters. In 2003 the national championships were held at Linwood and w ere won by Graeme Reid of Clydesdale Harriers with Stephen in second place The end of the season meant the six stage road relays and Cambuslanag was second to Racing Club: Stephen was on the last stage and he was unfortunate to drop one place to an in-form Glen Stewart. A good winter for the first winter back and it was straight into the summer of 2003. 13 races at four different distances all over the country and over a spell of eight months. Not too bad and he was nationally ranked as follows: 5K: 3rd (14:42), 5 miles 9th (24:45), 10K 3rd (29:55), 10 miles 1st (48:25), half marathon 3rd (66:50). 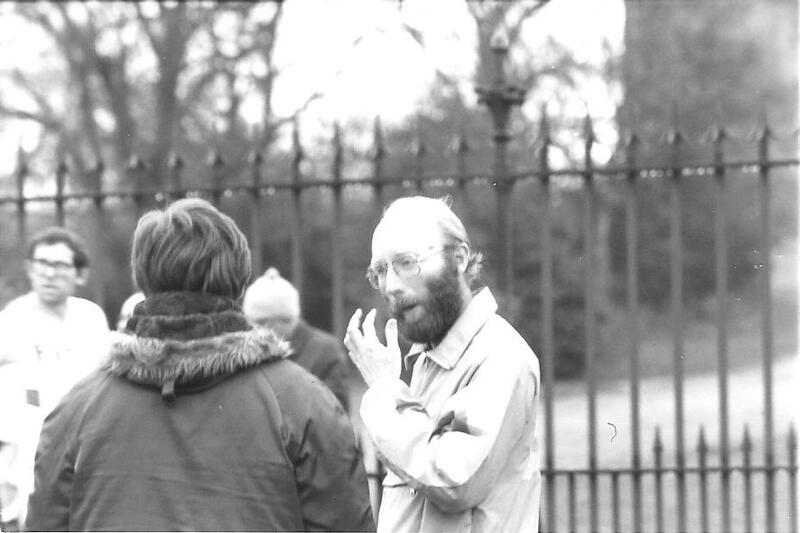 Stephen ran the last leg of the District relays in October 2003 and held on to first spot to see the club home first. Then on 6th December he ran on the second stage of the national relays and again the team won. There was no E-G any more so the next big race was the West District and Stephen did not run but in February he was 15th in the national. If summer 2003 had been good, then 2004 at least matched it. 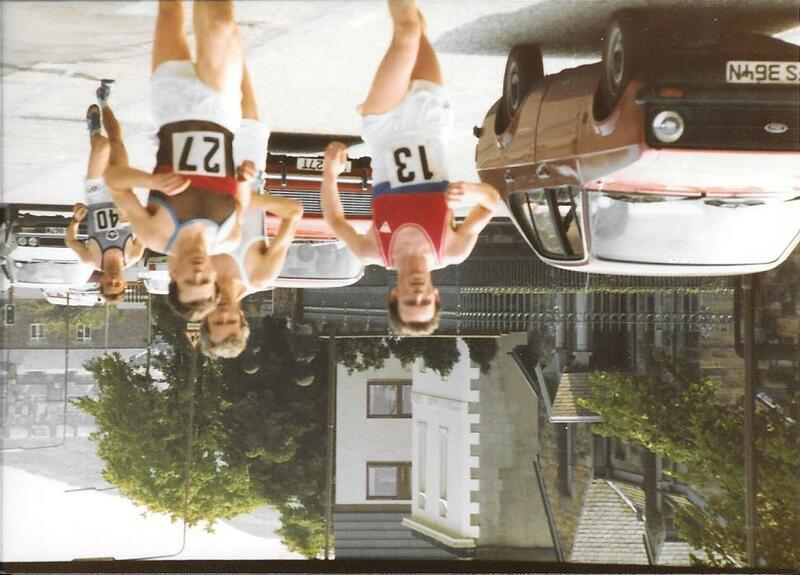 On the roads there were victories at Glasgow Caledonian, Barrhead (both 5K), Kinross High School, Troon Tortoises, Polaroid Helensburgh, Carluke Dev Trust, Polaroid Dumbarton, Stranraer (all 10K), Dunfermline, Monklands and East Kilbride (both half marathons). The quality of the opposition was usually quite high, reflecting the standard in the country at the time. The Dunfermline half marathon was the Scottish championship. As far as times were concerned Stephen was 13th for 5K, 4th for 10K, and 5th for the half marathon. On the track, he was not ranked at all and it may be that he was now a confirmed road runner. In the winter season 2004/05 and he was absent from the two championship relays in October and the national short course cross-country championship in January. Nor was he to be seen at the District or national championships, or even the six-stage road relay. Not a good winter for Stephen at all. He seldom raced the following summer either – unranked at 5K, 5 miles, 10 miles or half marathon in summer 2005, his sole appearance in the rankings was at 10K where he was ranked 18th for his 31:32 time at Auchencruive in February. He won only two road races in 2005 – at Dundonald in August over 10.5 K (33:48) and at the end of December when he won the Turkey Trot at Ayr in 32:03 for 10K. The clue to some of the absences was maybe to be found in his club affiliation for the races mentioned – he was ‘S Wylie (Girvan AC)’. Would the change in affiliation hold good for 2005/06? at the start of October 2006 in the District Relays at Irvine Stephen was on the second stage for Cambuslang for the team that finished third. Two weeks later in the national relays he was last stage runner and picked up a place but the club could do no better than fourth. In the West District Championships, Stephen finished third behind McNulty (Kilbarchan) and Pollard (Inverclyde) to lead the Cambuslang team home in first place. The national was held at Falkirk in early February 2007 and Stephen was tenth, the club was second to Hunters Bog Trotters. In the season’s finale – the six stage road relay – Stephen was on the fourth leg for his club and held the lead which the team held to the end. He had second fastest time on the stage. In the questionnaire, Stephen said that his birthday was in November 1971 – which meant that he became a V35 in November 2006. 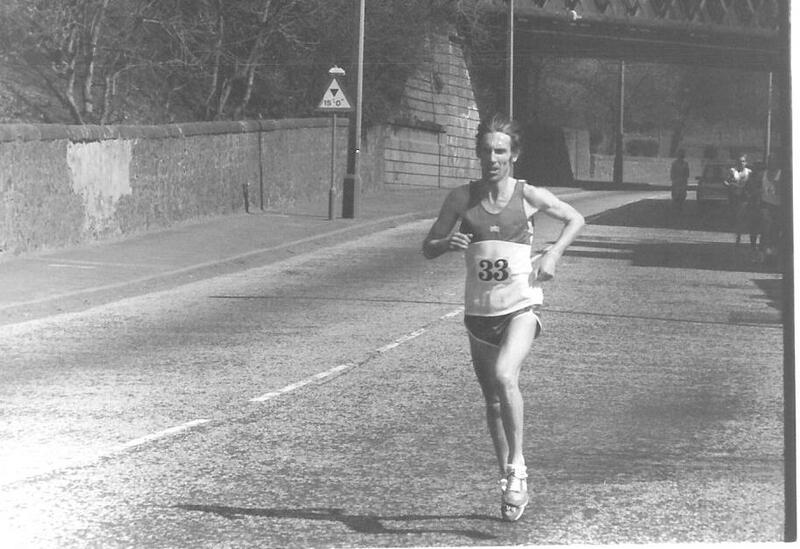 On the roads in 2006, Stephen was ranked 12th for the 10K with his time of 31:12 from the Ayr Turkey Trot in December and the initials V35 appeared for the first time. Before that however he had ranked 22nd for the half marathon in 2006 with 71:19 recorded in the Glasgow Marathon on 3rd September and, a first, seventh for the marathon itself with the time (2:30:09) that he recorded when finishing third in the Scottish Marathon Championship in Inverness behind Simon Pride and Jamie Reid. 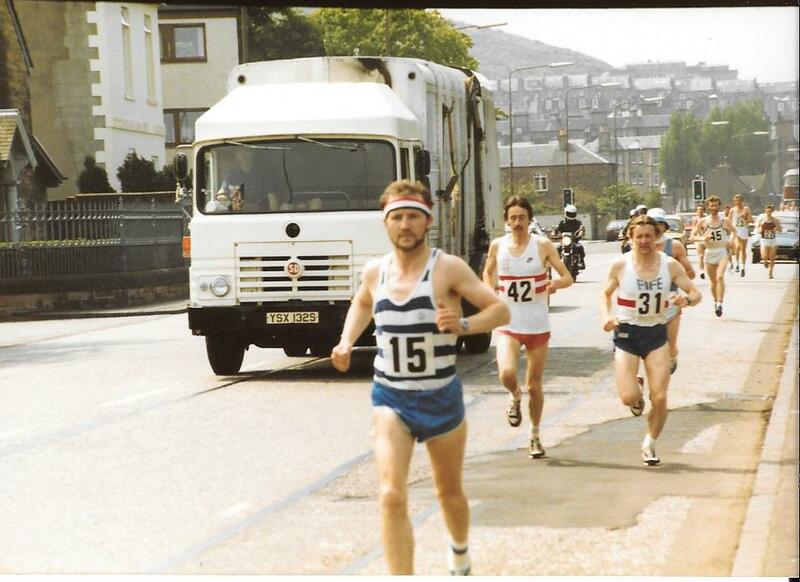 His race wins that year were few: the 10K at Stranraer on 4th November in 31:57, the Hugh Wilson 10K in East Kilbride on 3rd December in 32:23 and the Turkey Trot in Ayr in the colours of Girvan AC. Stephen was now a veteran and entitled to race in all their championships and internationals as wel as the full race programme for senior men. We will look at that part of his career on a separate page. “And Gymnastic games they remained until well into the second half of the twentieth century but by this time the games had developed into something much more like what you will be watching today. Traditional events such as running were and are still a major component of what is on offer at the games. It was at Alva in 1871 that the first highland games cycling took place. An old Scots favourite, quoiting, used to feature in the programmebut has now disappeared as, sadly, have wrestling, light field events such as high jump and pole vault and the former finale event of pony trotting. A more health and safety conscious society combined with the reduction in the size of the arena after the building of the extension to the former Alva Academy, also now lost to the developers wrecking ball, meant that pony trotting was deemed to be impractical and potentially unsafe. Their memory lingers on. With their passing, other events came to take their place. A full range of highland dancing, the full programme of heavy strength events, races for children, youths and visitors and, of course, the hill races. 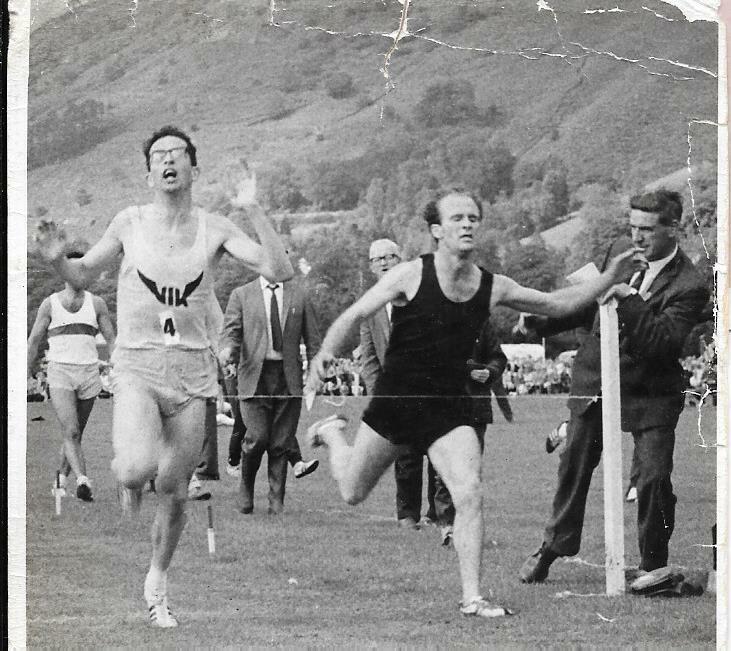 Although there are now four age-restricted competitions the hill race, originally known just as the Endurance Race, has always captivated the runners and the audience alike. It is a unique event with almost every inch of the race from starting pistol to finishing line being visible to the crowds in the arena. For well over 130 years, the ring at Alva has been surrounded by the attractions of the travelling fair now organised by the members of the Scottish Section of the Showmen’s Guild of Great Britain. Their continuing presence has ensured that the compact atmosphere of the arena is assured helping to build the feeling of anticipation and excitement as the events of the day unfold. Originally, competitions were restricted to local athletes only but with the passage of time this changed until we now have open competition of the most truly international kind. Dancers from Australia, Canada and the USA are to be found here regularly. We have had heavyweight athletes from Holland, Germany, Poland, Australia, USA, Canada and Finland and the entries in our hill races have come from throughout the British Isles with overseas runners from France, Catalonia, Belgium, USA and the Czech Republic. Our Visitors’ Book tells us that the spectators are now also truly worldwide with recent visitors from across Europe, Southern Africa, North America and even from Thailand! 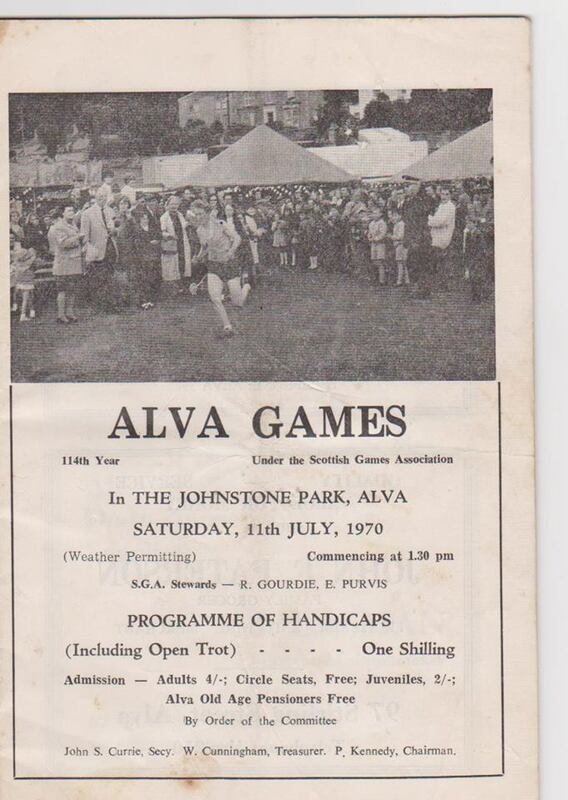 Known as The Famous Alva Games, they have adapted well to the changes in society at large and reap their rewards in the crowds who come along and the athletes who lend their talents to the occasion. 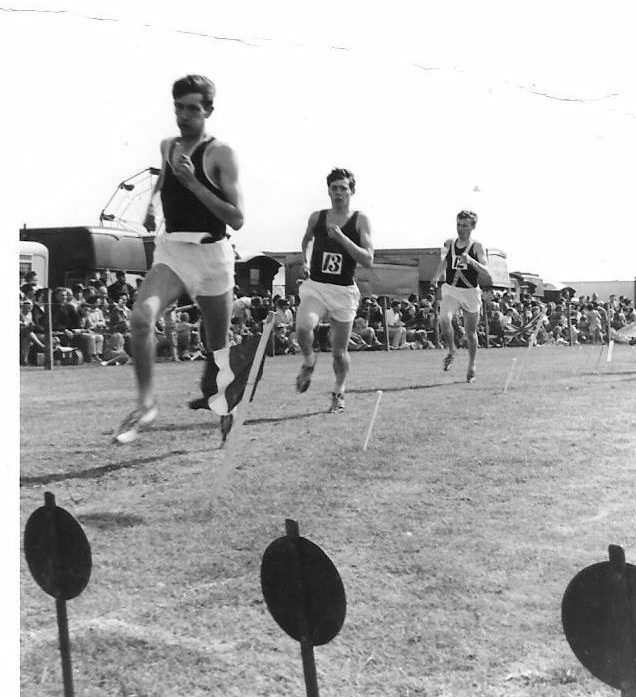 As an amateur athlete running in the 1960’s and 70’s, there were not that many Highland Games that I was able to run in if I were to retain my amateur status. The Strathallan Gathering at Bridge of Allan was one though and it was always a great day out. The meeting, on a dedicated Games Field, with a wonderful stand (now sadly gone), before a very good crowd with genuine personalities as Chieftain and with a fair in the adjacent field plus pony trotting after the Games had ended, was a real experience. I still go most years as a spectator but gone are the fireside rugs, cake stands and casserole sets as prizes and money prizes are good enough to be worth competing for. As well as being easy for the Committee to organise and hand out, they are often most welcome to the athletes. One former international athlete still complains about winning two races at two meetings in consecutive weeks (neither was at Bridge of Allan) and getting a large canteen of cutlery “worth £40” for both. This was in the 1950’s when money was tight. The permanent trophies for the various events are a good reminder of who has won what – they even have specific trophies for the younger age groups such as the Bastable Trophy for Under 17’s which my own athletes have won three times. The following historical appreciation is from the meeting programme. “The Strathallan meeting in its present form has held a central place in traditional Scottish sport for 150 years. Before that its origin can be found in the sports gatherings of ordinary country folk when the Lairds met to play at, “Tilting at the ring” under a charter granted by James I in 1453. A link to the old Wappenschaws, (a kind of medieval “Home Guard” when every grown man had to show his weapons in good order), is tenuous, but what is certain is that by the early 19th century competitive sports were taking place here on a regular basis. William Litt of Cumbria wrote in 1823 of “The famous old school of wrestlers in Strathallan, Stirlingshire”. There is no record of when The Country Archery and Rifle Club was founded but it was probably about 1825 and it also held sports competitions at its meetings. Their competitions became the Strathallan Highland Games and were organised by JA Henderson of Westerton from at least 1848 until 1858 when he died. Major General Sir James Alexander, K.C.B., became Laird of Westerton in 1863 and reorganised the games which have been held annually ever since then with the exception of the duration of the two World Wars. Youths: Youth races are in two age groups – 10 to 12 years and 13 to 15 years; 90 meters flat race – Open; 200 meters flat race – Open’; 400 meters flat race – Handicap; 800 meters flat race – Handicap (Turnbull Trophy). 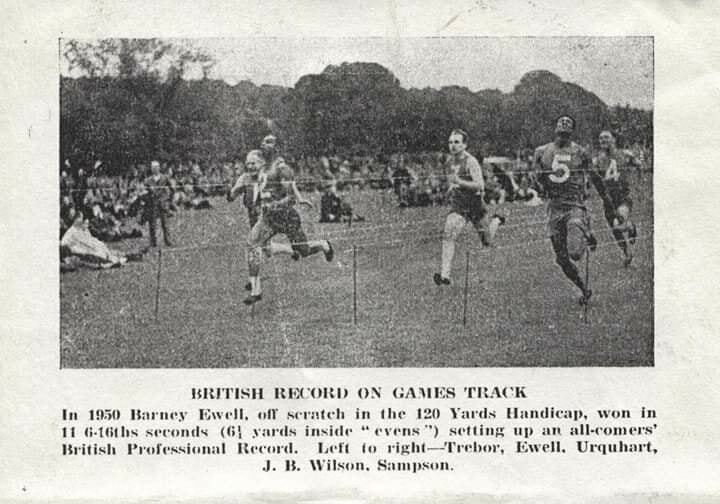 Compare this with the events at the meeting held on 1st August, 1970: 100 yards; 220 yards; 880 yards; Mile; 2 Miles; 21 miles road race; Long Jump; Triple Jump; High Jump. Women: 100 yards; 220 yards; 880 yards; High Jump; Long Jump. Youths: 100 yards; 220 yards. The switch from amateur to professional has meant that there are no team races at all, there had formerly been only two events for Youths (100 yards and 880 yards) against the four races x 2 of the present, and of course there is no road race. This is a pity. 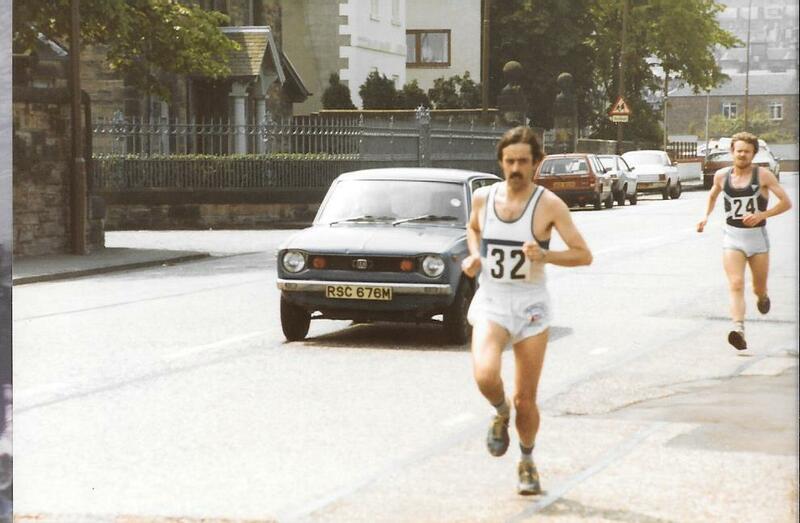 The famous Dunky Wright and the Scottish Marathon Club had encouraged the organisers to hold a 20 mile road race as part of a SMC programme of races leading the runners towards the twenty six mile + of the marathon. 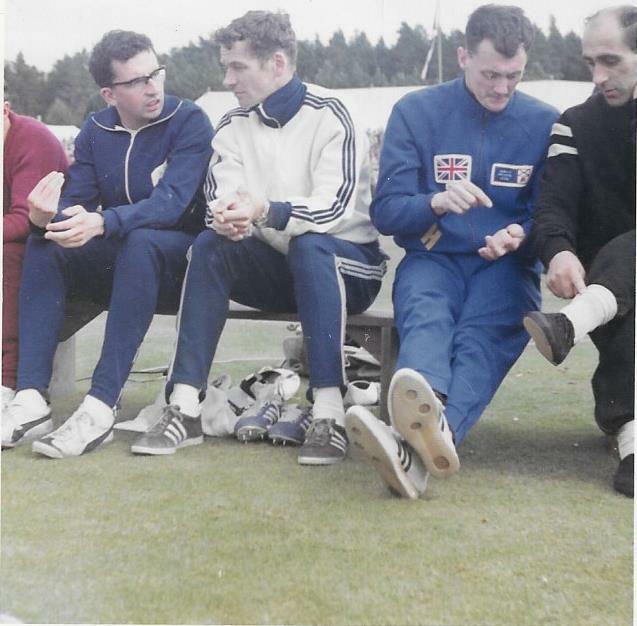 Part of the SMC four race championship it was well supported for many years with all of the very best in the country running there – Joe McGhee, Jim Dingwall and all the rest came to Strathallan for the race. Entries fell and the distance was reduced twice before being removed from the programme. It is still a good meeting, still well attended it is popular with lots of local sponsors but is now, like all the others, a professional event and will have a good future ahead of it. There is more but for the full story you should visit the website where the story from 1853 to the present day is detailed in nine chronologically ordered chapters. It is probably the best set out and most detailed description of a meeting on the internet and well worth a visit. The direct quote is important because each of the meetings has its own particular history and traditions which to a large extent dictate the individual nature and content of each meeting. 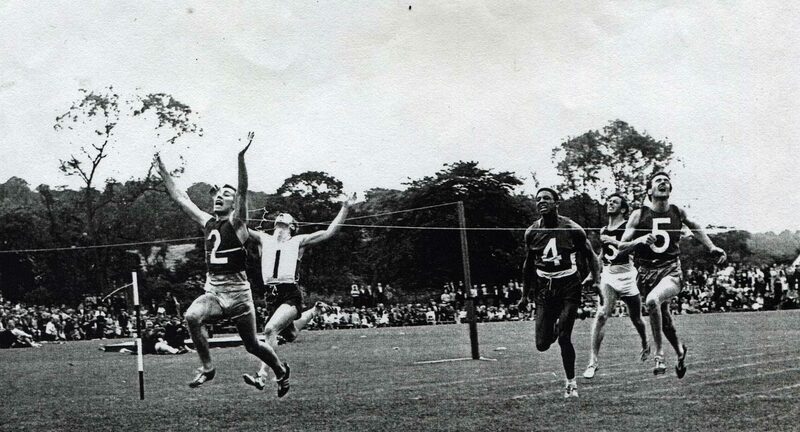 Sprinters at Jed include the great Australian Eric Cummings, Edinburgh’s Ricky Dunbar, who shaved three one-hundredths of a second off Ewell’s record in 1965, the incomparable George McNeill and, much more recently, Olympic sprinter Nick Smith from Dunfermline and there were the legends of the sport such as Dave Walker, Jimmy Bryce and JB Steede. Of course the Borders is a stronghold of Scottish Rugby and naturally it has seen many take part, generally in the sprint. British and Irish Lions to compete include Peter Dods, Colin Deans, Alan Tait and Tony Stanger – with Dods winning the sprint in 1980. Tait was a frequent competitor on the circuit. The programme currently has 34 events and starts with a Round the Town race at 6:30 am. Traditionally a small cannon is also fired from the town square at 6:30 am in all four directions to mark the start of Games Day – and the start of the race which needs 5 runners before it can be held. The starts with a race for athletes with special needs and there are races for Youths, for Juniors, for Seniors and for Over 45’s, events for Ladies, races for Front markers and for Back Markers in most categories, and an Obstacle Race. There are also races for 6 – 8 year olds and 9-10 years old (boys races and girls races held separately). There is also an interval at mid-day during which the crowd is entertained by a pipe band. 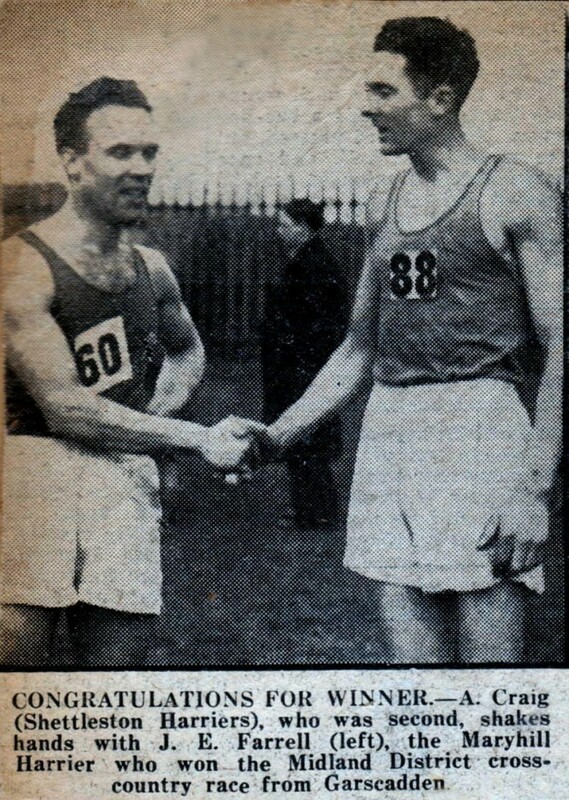 Two of the big names in Games distance running – G Tinion from Dearham and J Brotherstone from Gordon were frequent visitors and both defeated former world record holder Gordon Pirie in the Mile where Brotherstone won in 4:10.5; Pirie was also well beaten in the Two Miles. He was later quoted as saying that he was surprised at the high standard of running on display. He would not be the only visitor surprised in that fashion. The Games have also had their fair share of controversy. 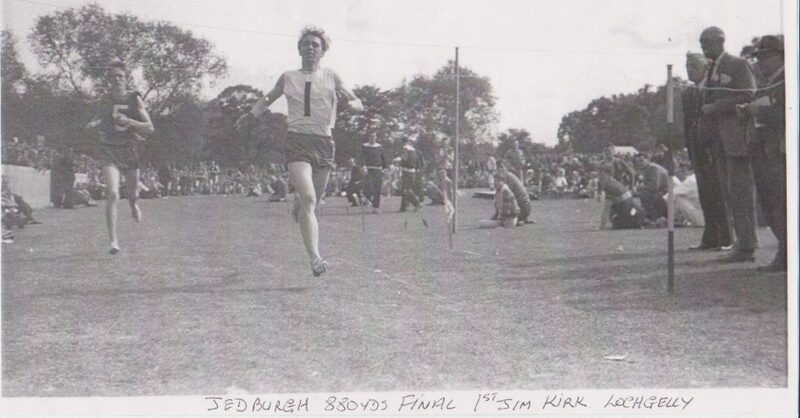 For instance in 1961 young James Kirk from Lochgelly ran in the Mile Race, ran well and was first over the line. The representatives of the second placed runner put in a protest on the grounds that their man had been jostled going down the back straight. The protest was upheld by the meeting judges and Kirk disqualified. Many that day thought that Kirk had been the better man on the day and deserved to win but that’s not how it worked out. Kirk threatened to leave the sport but fortunately he did not and went on to have a great career as an athlete. In 1964 Olympic sprinter Berwyn Jones refused to run after “discussions with the Committee” because he had claimed appearance money of £60 . Then there was the story of Tommie Smith, the Olympic 200m gold medallist who became a professional athlete and competed in Britain in 1972. He ran in Wakefield for the title of World Professional Sprint Champion against some of the best of British professionals who included Scotsmen George McNeill, Bob Swann and John Steede. He travelled up to Jedburgh on the Thursday and tried to enter but, as entries closed two weeks before the meeting, his was not accepted on the grounds that the rules applied to everyone. Legally correct – but there have always been times when a late entry was accepted – on one occasion I had an entry on the day accepted for a Games Hill Race, probably because I would not interfere with the proceedings at the head of the field. Like all athletics – professional and amateur alike – and maybe like most sports, the numbers have dwindled, spectators and competitors alike. But with a tradition as strong as Jedburgh’s you can bet that the Games will continue to flourish. 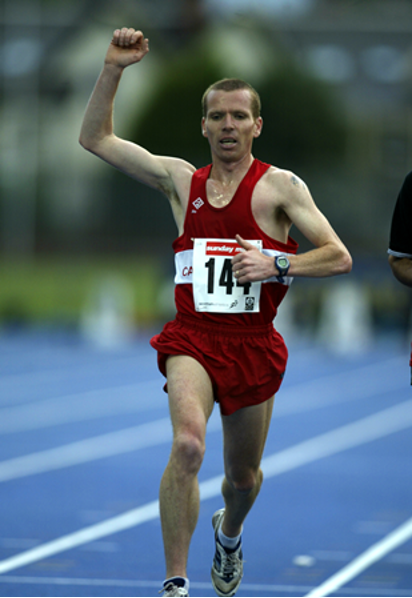 Alastair Macfarlane had a very successful career as a middle distance runner on the professional Games circuits. 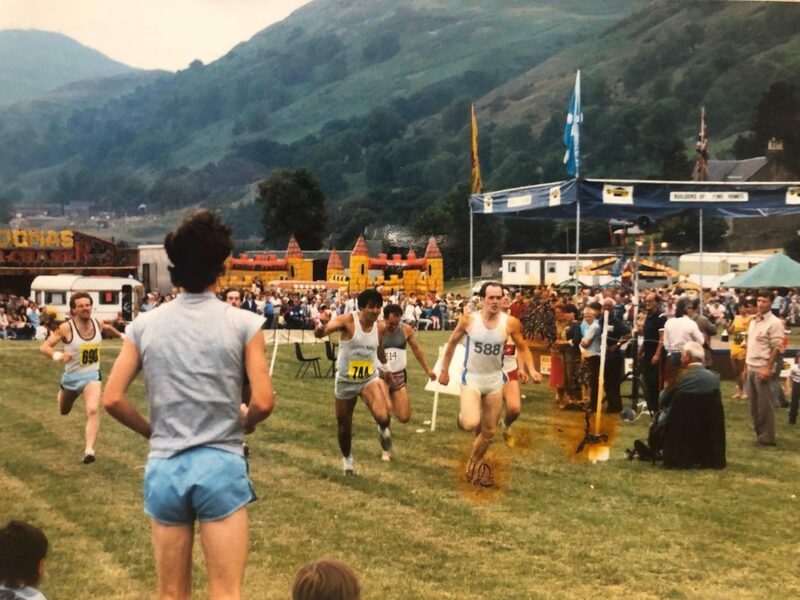 Some run only in the Fife Games, others restrict themselves to the Borders and the West Highland events have their own devotees but Alastair ran in them all – from Oxton and Grasmere in the Lake District to Pitlochry in the Perthshire highlands, from Thornton in Fife to the Games at Luss – and ran well. These are just some photographs from his collection. 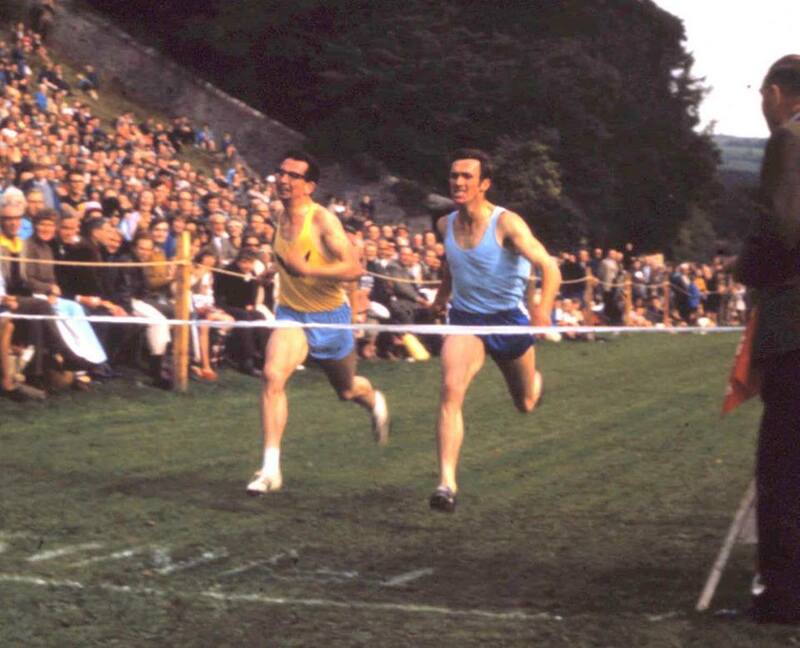 On left, winning on the line from Sandy Nelson at Pitlochry – have a look at the size of the crowd. Just some of the trophies! 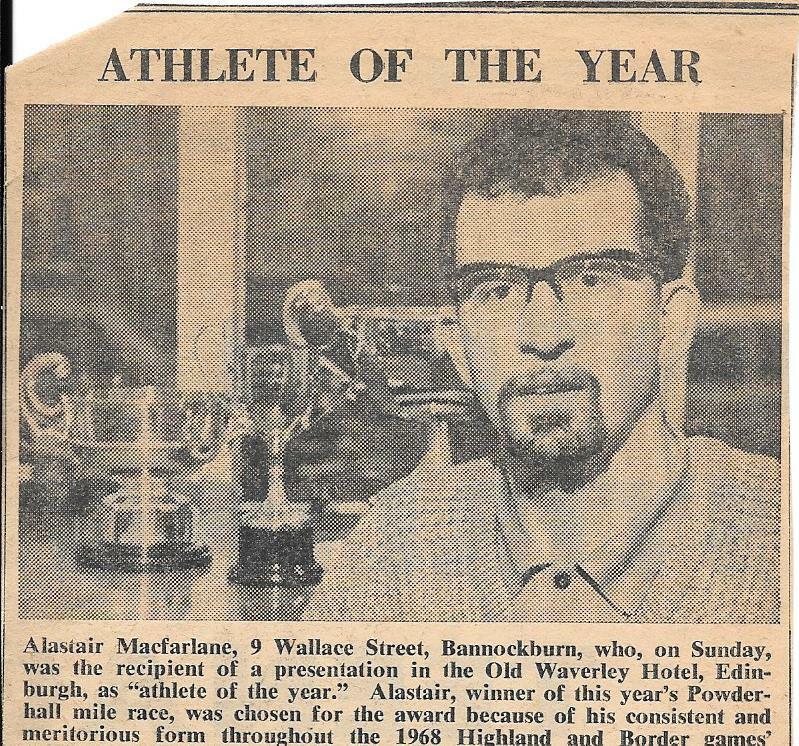 Alastair Macfarlane was one of the best runners in the country: first as a professional middle distance runner, and then as a top class amateur road runner who won international honours as well as being SAAA marathon champion. The following pictures are from a collection of some that he has taken himself. You will know most, if not all of the subjects – Jim Brown Nat Muir, Graham Laing, Sandy Cameron, Tom Donnelly, Tommy Wiseman, Peter McGregor and so on. Following on from the account of the ten mile track championships from their inaugural run in 1886 to their unfortunate death 90 years later in 1976, short profiles of the runners who won medals of whatever colour in the races are presented here for information. Those athletes who already have individual profiles are linked to these profiles where their name appears on the text on the race reports [recognisable because they are in blue.] We will do it in chronological order. W Henderson, 1887. was a member of the Clydesdale Harriers national cross-country winning team in 1888 when he was fifth. In the breakaway SHU version of the national cross-country championship in 1890 he was in the winning Glasgow team where he was tenth. P Addison, 1888, Edinburgh Harriers: In addition to winning the 10 miles track championship in 1892 and being third in 1888 and 1896, Addison ran in and was a member of the winning Edinburgh team in the first ever National Cross-Country Championship in 1886 and continued to represent the club in a series of national championships where he continued to win team medals in 1891 and 1895 when the team won for the first time in several years..
Charles Pennycook, 1889, of Arthurlie FC and Clydesdale Harriers, had an illustrious athletics career winning the National Cross-Country title in 1892. He had previously won the breakaway SHU Cross-Country Championship of Scotland in 1890 under the Scottish Harriers Union rules. On the track he won the SAAA Mile in 1889 and was second in the Ten Miles in the same year. There were also second and third place championship medals plus team medals. 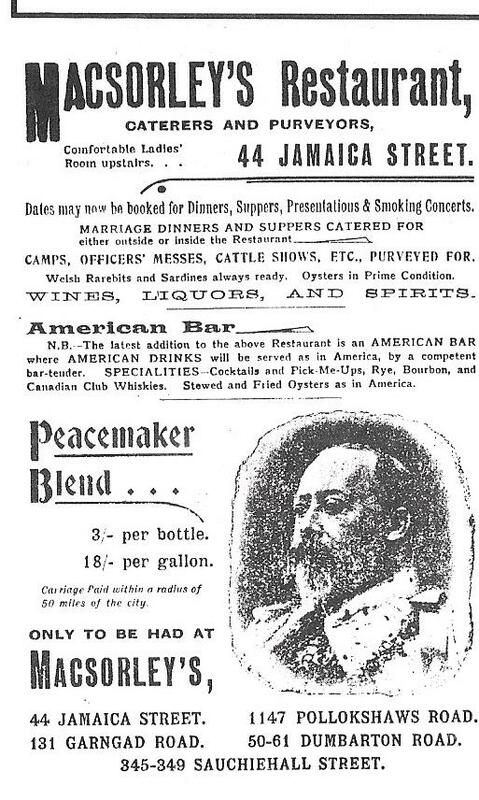 He went on to be President of the SAAA in 1907/08. TIS Hunter, 1890, Edinburgh Harriers, was second in the ten miles track twice (1890 and 1892), and third in the four miles in 1890. This was his first year running in the championships but his talents stretched to cross-country where he was a solid club cross-country runner who ran in several national medal winning teams, starting with second team medals in the SCCA championships in 1890, winning team medal in 1891 (he was sixth), and a personal best finish in 1894 when he was fourth. He ran often on the track and won prizes in events as disparate as the mile flat, the novelty race (one lap race walking, one lap running backwards, one lap running) and the three and four miles events. 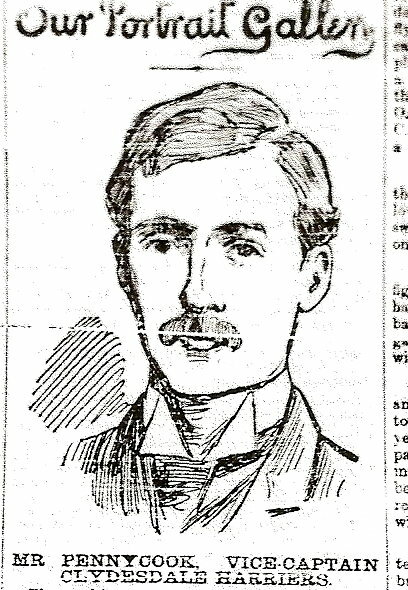 WM Carment, 1891, Edinburgh Harriers, medallist in both 10 miles and one mile, as well as being a regular member of medal winning cross-country teams for his club, he won individual silver in the 1892 national championship and bronze in 1893. Carment went on to become Secretary/Treasurer of the SCCU between 1892 and 1897. P McMorrow, 1892, West of Scotland Harriers and Celtic Harriers, ran in his first national cross-country championship in 1892 where he finished tenth for the team that finished third. He never won team or individual medals on the country but won prizes at distances from 880 yards to 4 miles in track handicaps. 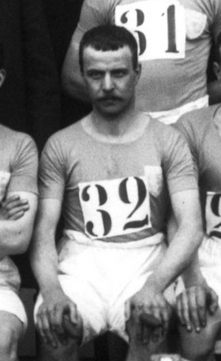 RA Hay, 1896, Edinburgh Harriers, was Scottish Cross-Country Champion in 1896, also over a ten miles course, leading his club to first team honours. His first cross-country national was in 1894 when he was 11th for the team that finished third for the second year in succession. David White Mill 1901 Clydesdale Harriers. One International Cross-Country vest. His first National run for Clydesdale was in 1896 when he was part of the gold medal winning team. He won the National Cross-Country (plus team gold) in both 1901 and 1902. Individual silver (and team silver) in 1900. Four Miles Track champion in 1901, after bronze in 1899 and silver in 1990. Four Track International vests: at 4 Miles versus Ireland – winning in 1901. 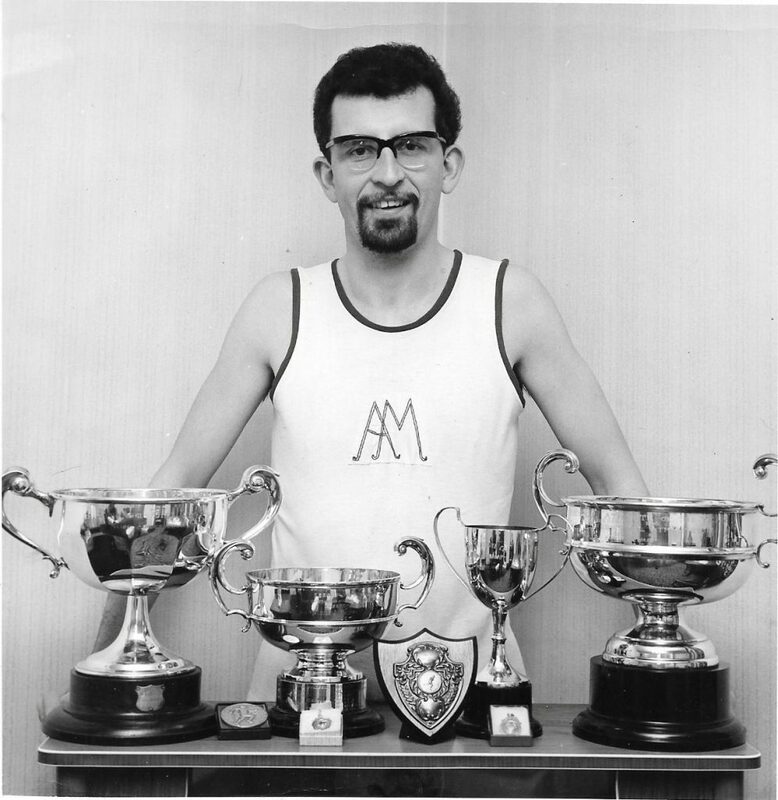 Mill started out with Greenock Glenpark Harriers,and switched allegiance to Clydesdale Harriers for several years during which he won National titles on the track and over the country before returning to run again for Glenpark. on the track where he won the 10 miles track six times (1904, 1906, 1907, 1908, 1909 and 1910) and was second once (1905) as well as winning the Four Miles in ’08, being second in ’05, ’06, third in ’07, second in ’09 and second in ’10. over the country where he won the national championship in 1907, ’08. 09 and 1912. Sam Stevenson, 1905 ’08 Clydesdale Harriers. 3 International Cross-Country vests. Four Miles Track champion in 1905 and 1906. Olympic Games 1908. Four Track International vests versus Ireland, winning twice. Peter Russell 1905 Bellahouston H. 2 International XC vests. W Bowman 1907 West of Scotland H. 4 International XC vests (including 11th and first Scot in 1909). 5th in 1907 National XC (plus team silver). William Robertson 1908 Clydesdale H. 2 International XC vests. National XC team gold 1906. Track One Mile silver medallist in 1897. Two Track International vests versus Ireland, competing in 880 yards, One Mile and Four Miles. Eventually suspended for professionalism. Alex McPhee 1909 Clydesdale H. 3 International XC vests, including 8th and first Scot in 1910. National XC champion in 1909 and 1910. Team 1st equal in 1910. Four Miles Track champion in 1909 and 1910. His father was a good professional runner; and his younger brother Duncan a fine Scottish International 880/Mile athlete. Alec Mann 1909 Clydesdale H. 3 International XC vests. 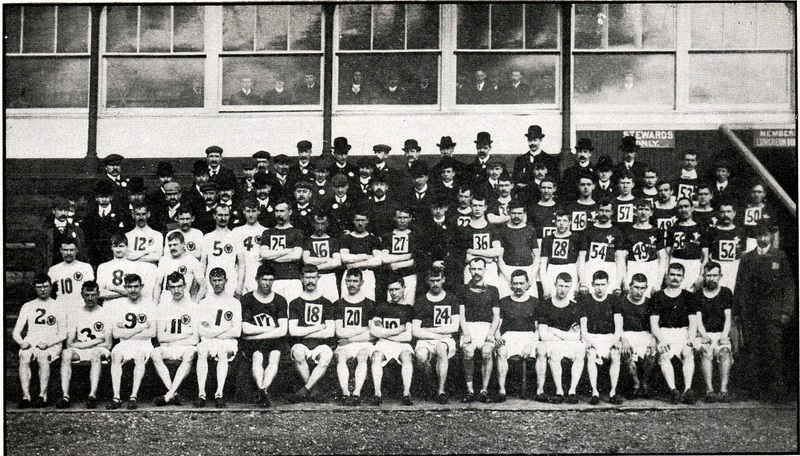 National XC team gold in 1907; team silver in 1909 (individual bronze); team gold in 1910 (individual 5th); team silver in 1911 (individual 4th); team silver in 1912; team bronze in 1913. He was also known as a road runner well before it was fashionable for amateurs to do so. 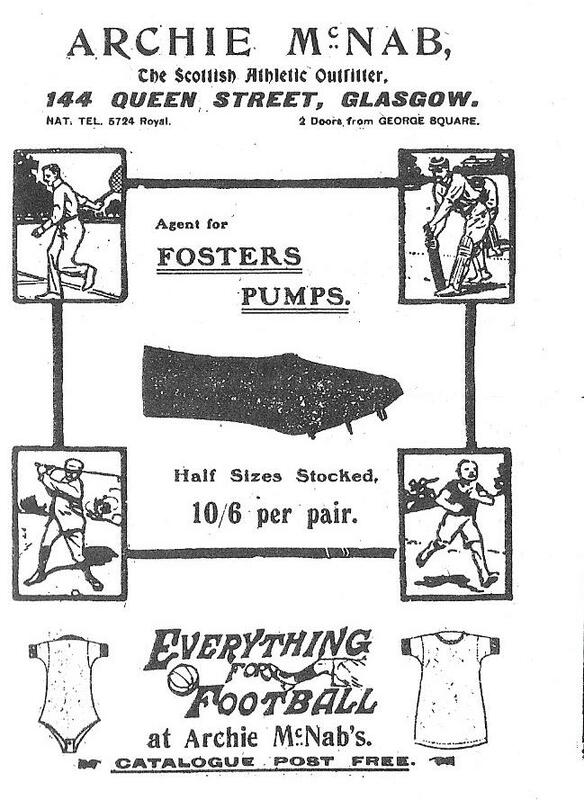 Angus Kerr 1911 Motherwell YMCA H and Bellahouston H. 4 International XC vests: 1911, 1912, 1913, 1920. He finished a fine 11th in 1913. National XC individual silver in 1912, one second behind Tom Jack. Team silver in 1920, when he finished 9th. One Track International vest versus Ireland, running the Four Miles. A Smith 1913 Clydesdale Harrier. One International Cross-Country vest which was won in 1920 . George Cummings 1914 Greenock Glenpark H / Bellahouston H? One International Cross-Country vest. In the 1914 National Cross-Country he finished 6th (plus team gold). John Cuthbert 1921 Garscube H. One International Cross-Country vest. In the 1921 National Cross-Country, he finished 9th (plus team silver); and added another team silver in 1923. P Martin 1923 Maryhill H. In the 1926 National Cross-Country, he contributed to team silver. James Mitchell 1925 Kilmarnock H/Mauchline. 2 International Cross-Country vests, including 1926 when he finished 5th and was first Scot. In the National Cross-Country he was second in 1925; and became champion in 1926. Daniel Quinn 1926 Garscube H. One International Cross-Country vest. In the National Cross-Country he won team bronze in 1923; finished 8th and secured team gold in 1925; and in 1926 was fifth and led his club to team gold. William Sutherland 1935 Shettleston H. 4 International Cross-Country vests. In the National Cross-Country he was 6th in 1935; secured team silver in 1938; and finished 8th (plus team bronze) in 1939. He ran regularly in the Edinburgh to Glasgow Road Relay and contributed to team silver in 1936 and bronze in 1939. William Kennedy 1937 Kilbarchan H. 2 International Cross Country vests. He finished 10th in the National Cross-Country in 1937. Gordon Anderson 1947 Bellahouston H. One International Cross-Country vest. In the National Cross-Country, he was 4th in 1947 (plus team gold); 8th in 1948 (team silver); and 12th in 1949 (team silver).